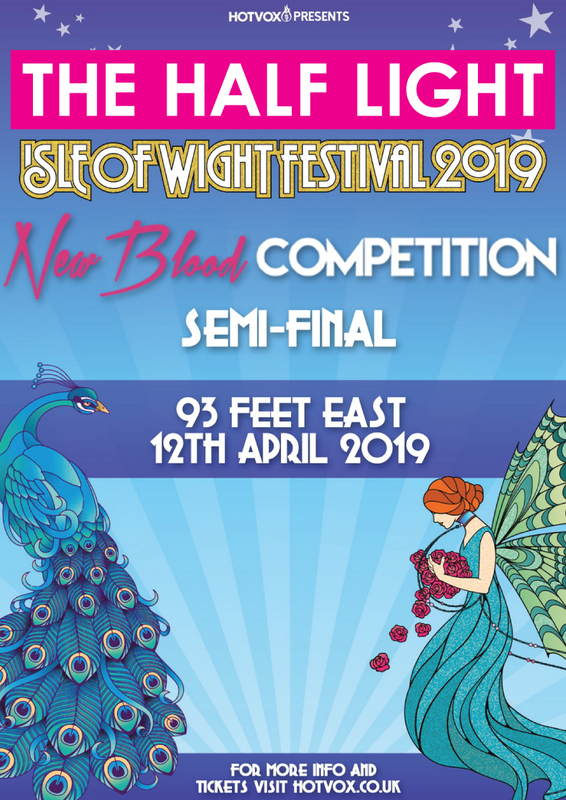 The next round of Hot Vox's Isle Of Wight battle of the bands contest has been set, with The Half Light's semi-final taking place at 93 Feet East on April 12th. With a place in the finals now at stake, please do come along, enjoy and support! More info in gigs. The Half Light are back in rehearsal this week following our success in the Isle of Wight battle of the bands quarter final gig. Semi final date to be announced shortly. Thanks again to Chris Marchant for these photos and to everyone who came along to support us. 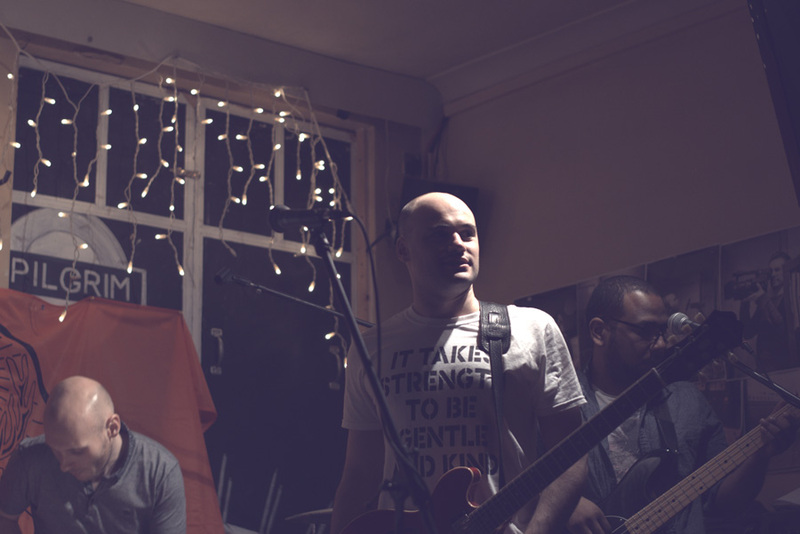 Ahead of this Thursday's Isle Of Wight battle of the bands gig, The Half Light are proud to introduce our newest recuit, James, featuring in a selection of new photos from Chris Marchant. Welcome to the gang mate. 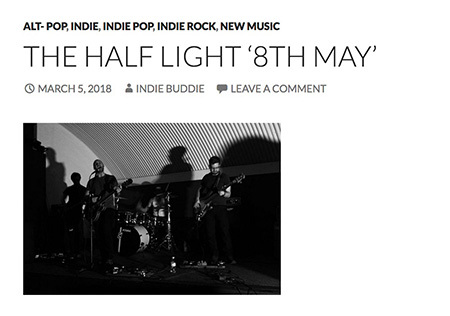 The Half Light are proud to annouce that they are into the quarter finals of Hot Vox's Isle Of Wight battle of the bands contest, with a slot at the festival up for grabs for the winners. 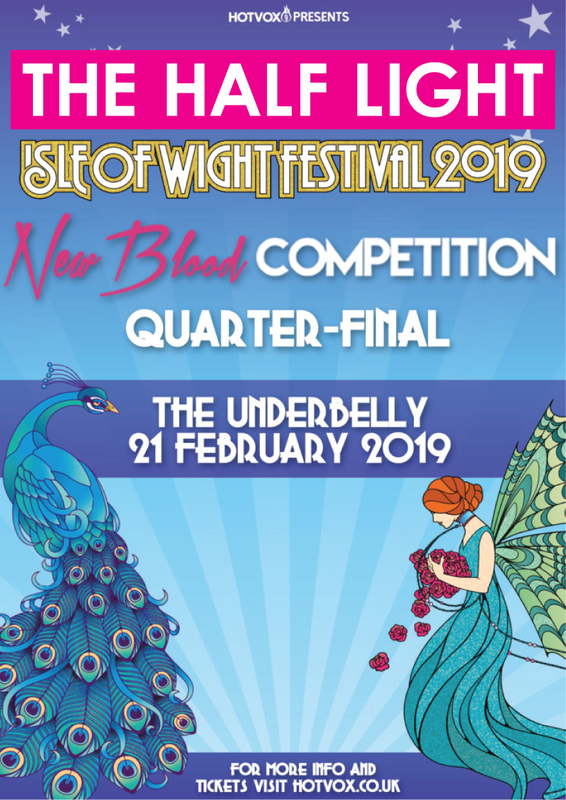 The quarter finals take place at Underbelly on February 21st on what promises to be a great night, so please come along, enjoy and support! More info in gigs. 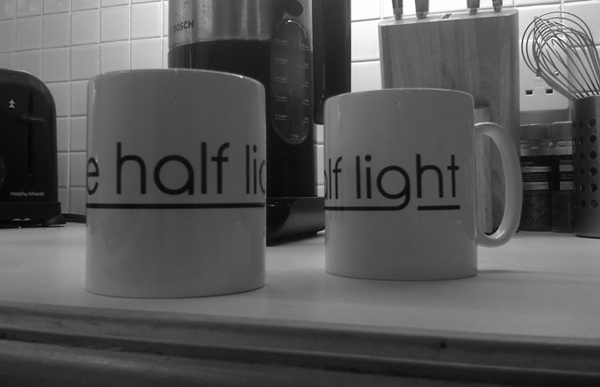 The live versions and interview that The Half Light gave on Leisure FM are available now. Thanks to Dave and the team for having us in! 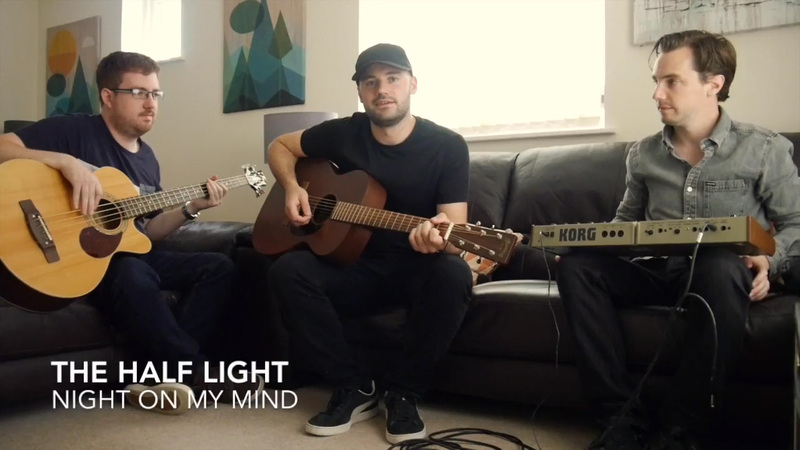 The Half Light popped in to Live In The Living Room last weekend to perform Night On My Mind and Seven Summers. Thanks to James for having us in. Thanks to John Jowett who has sent over some great pictures from our set at Clarence Park Festival. You can see more of John's work here. 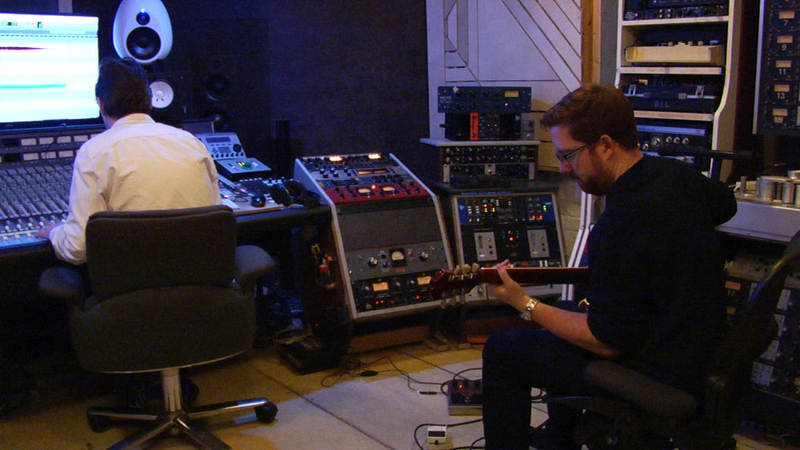 Take a look at the making of our latest record with this behind the scenes video. 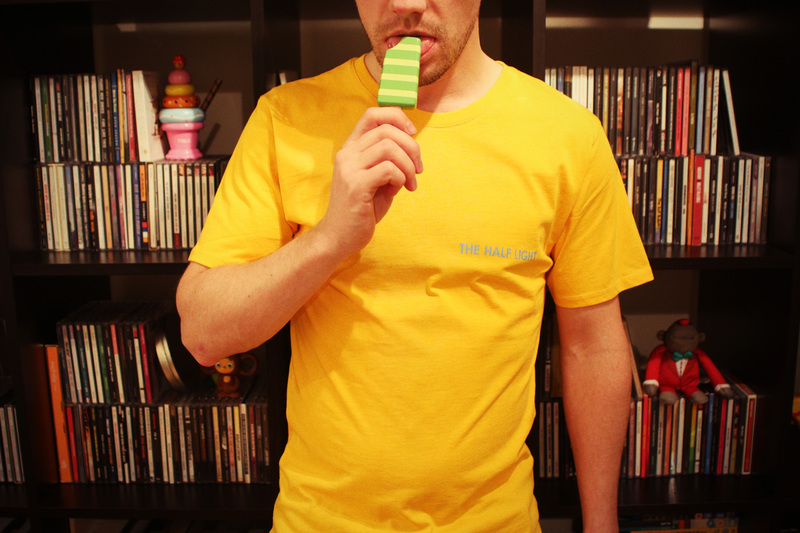 What better way to mark this most un-English of summers than with a Seven Summers shirt? Available in the shop now. 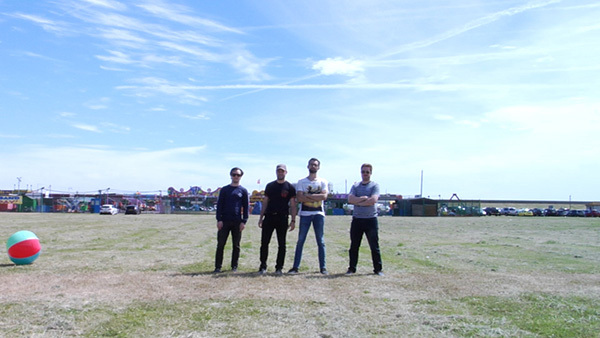 The Canvey Island set video for Seven Summers is out today! 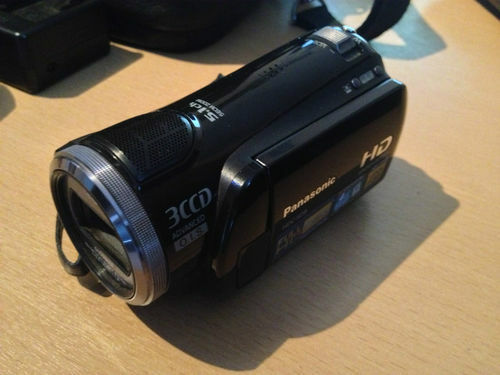 Thanks to Pete Scorer for his camera work. Danu at Indie Buddie has reviewed the full Night On My Mind EP on the day of release, declaring Seven Summers the, 'sweet icing [on] a delightful triad of glorious indie'. Thanks Danu! The Night On My Mind EP, which features new single Seven Summers, is out today! Buy it or stream below. Colin Noble rounded off the week's Seven Summers airplay, letting his listeners know that we have, 'saved the best one until last', last night on his ARfm show. Roy Stannard gave Seven Summers a spin and declared it, 'the strongest on the EP', last night on his Seahaven FM show. Thanks Roy! Ian France enjoyed giving the, 'slinky elegance', of Seven Summers its radio debut on his Penistone FM show last night, you can hear a clip below. 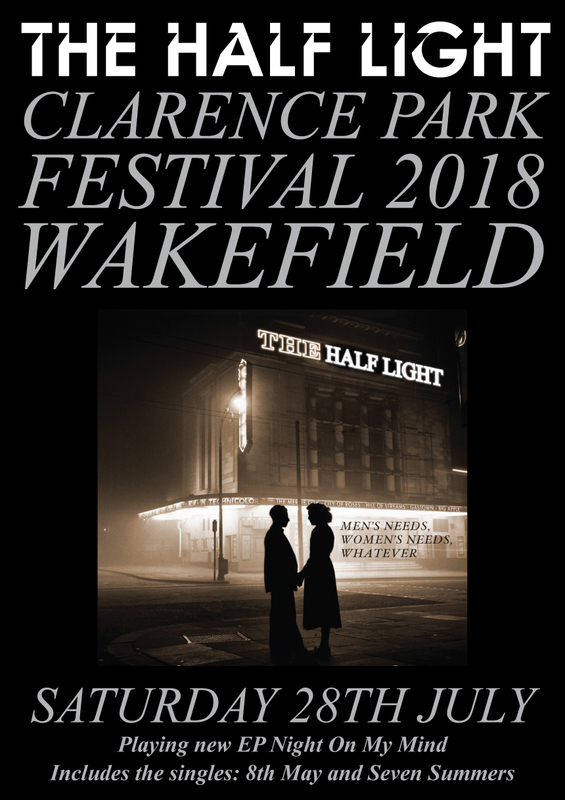 The Half Light are proud to annouce that they will be performing on the Saturday of this year's Clarence Park Festival in Wakefield. 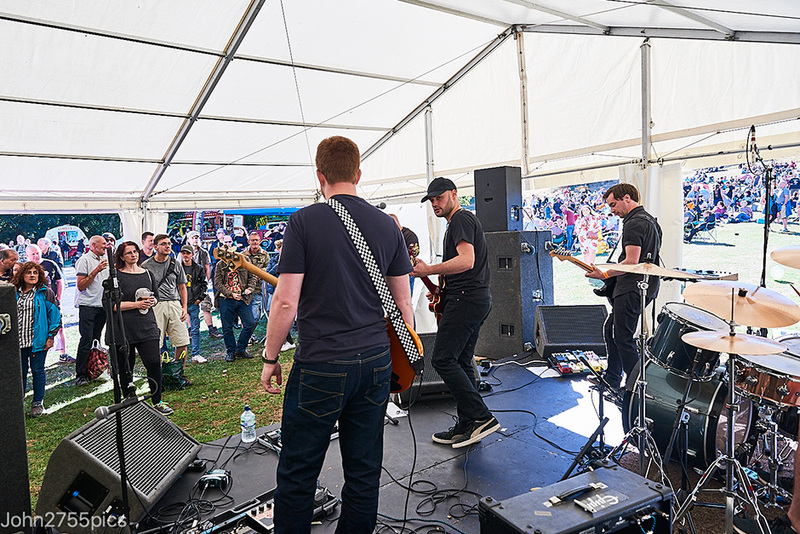 The festival, now in its 28th year, is the longest running free music festival in Yorkshire and is expected to attract up to six thousand people across the weekend. More info in gigs. 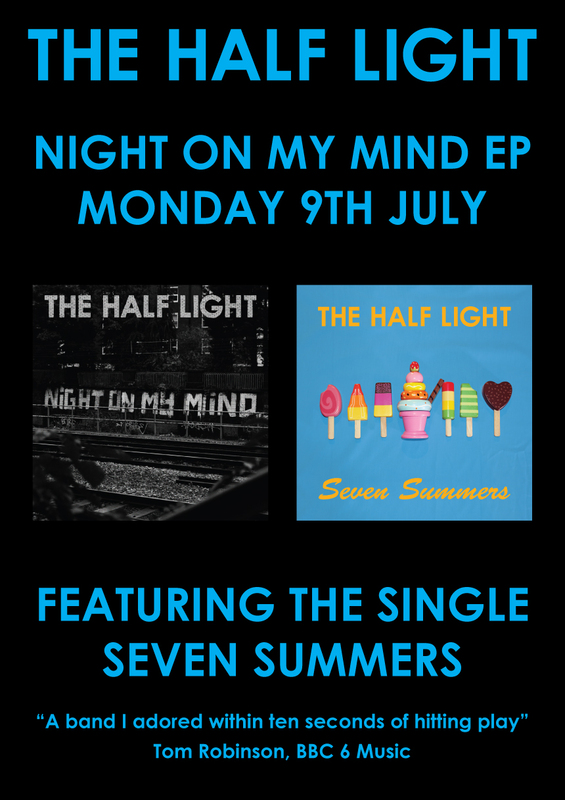 The Half Light are delighted to annouce that the Night On My Mind EP will be released on 9th July alongside the final single from the record, Seven Summers. 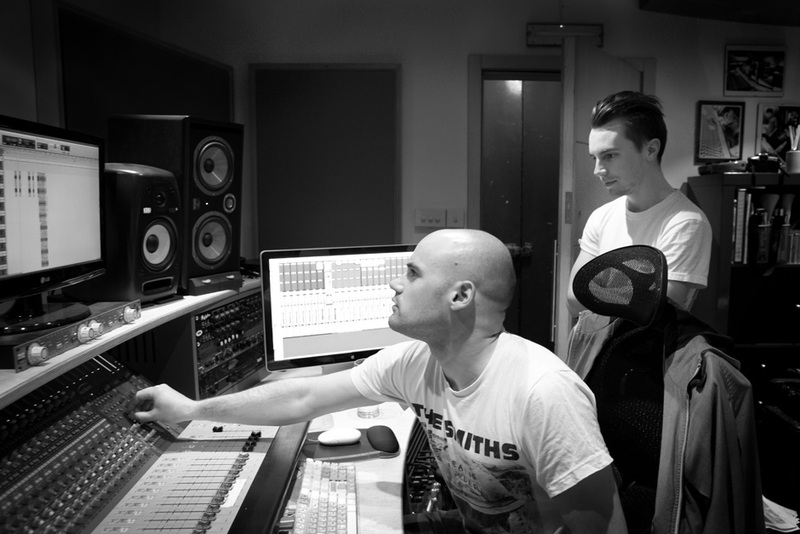 Night On My Mind was recorded in December 2017 at Musicland Studios, Haggerston and was produced by Ian Flynn of Werkhouse. Even a pro like Danu can't possibly account for the unshakeable humour of the Great British public, here are a couple of short outtakes from the Night On My Mind shoot. To celebrate the release of Night On My Mind, the shop has just been stocked with brand new NOMM shirts and longsleeves. The Night On My Mind video is out today! Thanks to the super talented Danu Sunth for starring. 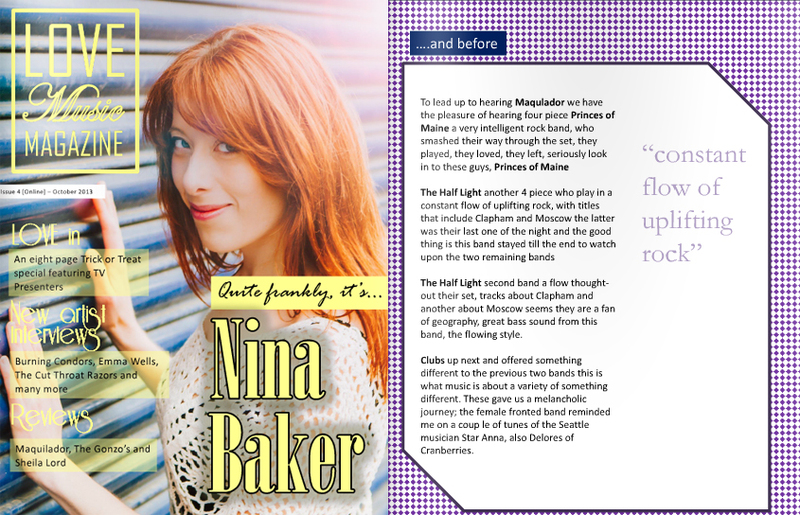 Danu at Indie Buddie has reviewed Night On My Mind, declaring the song to be a, 'blissfully melodic gem'. Night On My Mind is out today! Buy it or stream below. Tim Willet gave Night On My Mind a spin on The New Music Generator last night, you can hear a clip below. Colin Noble gave Night On My Mind its first play on his ARfm show last night, you can hear a clip below. 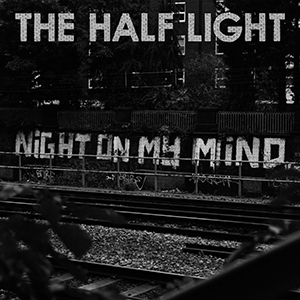 The Half Light are delighted to annouce that the title track from their upcoming Night On My Mind EP will be released on 30th April. 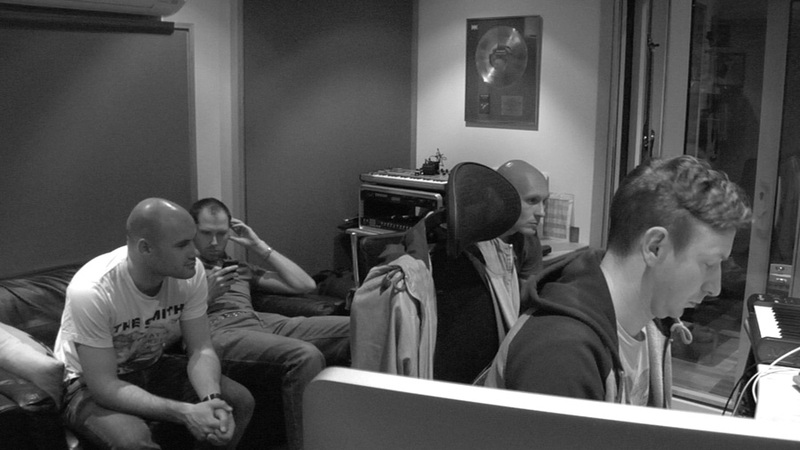 Night On My Mind was recorded in December 2017 at Musicland Studios, Haggerston and was produced by Ian Flynn of Werkhouse. 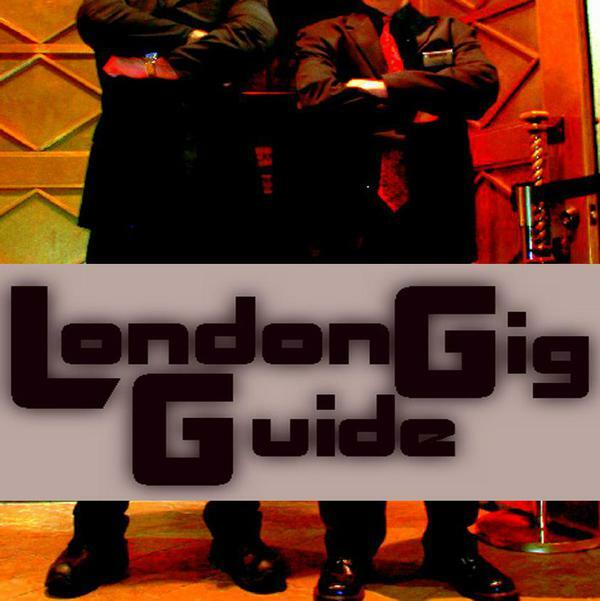 The release is supported by a gig at Hoxton Square Bar and Grill on the 11th May. The video for 8th May is out today! Thanks to Chris Marchant, Paul Prentice and Duncan Watson for their help in putting it together. Alex from Words For Music has made 8th May their Single Of The Week. Click here to see what they had to say about the record. Buonasera! 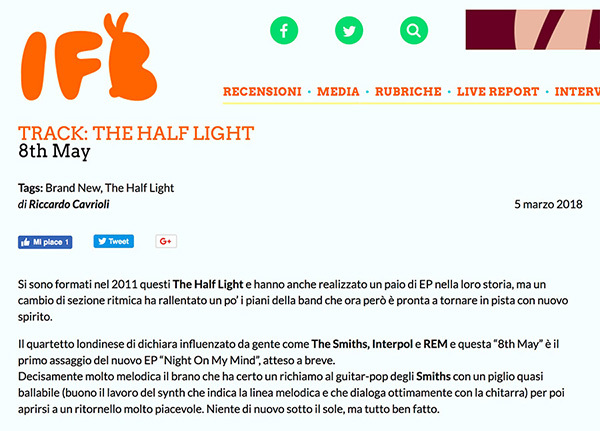 Italian blog Indie For Bunnies have given 8th May a review on the day of release. Click here to read what they made of the single. Grazie amici! On the day of release, Danu at Indie Buddie has given 8th May a review. Click here to read what they made of the 'catchy gem'. 8th May is out today! Buy it here or stream below. 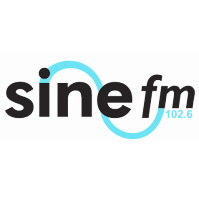 Rounding off a day of pre-release coverage, Jon Kelly gave 8th May a play on his Sine FM show. You can hear a clip below. 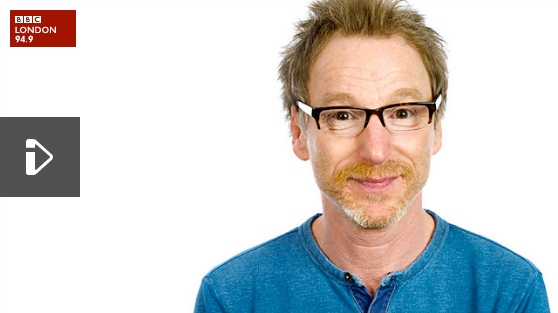 Simon Oliver kicked off this week's Sunday Alternative Podcast with 8th May. You can hear a clip below. On the eve of release, Michael Lindley gave 8th May a spin on his Radio Kaos Caribou show. You can hear a clip below. One day ahead of release, Olivia Tambini at Killing Moon has made 8th May her Track Of The Day. 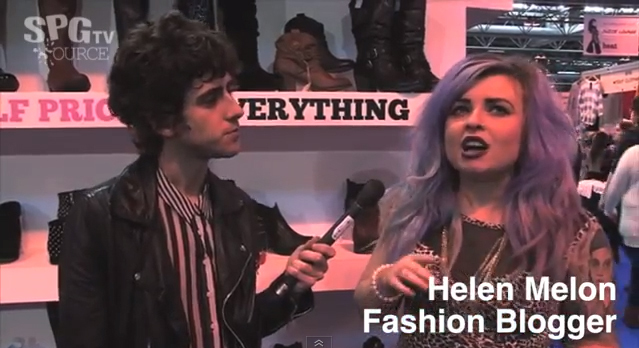 Click here to see what she had to say about the song and for an exclusive first listen. 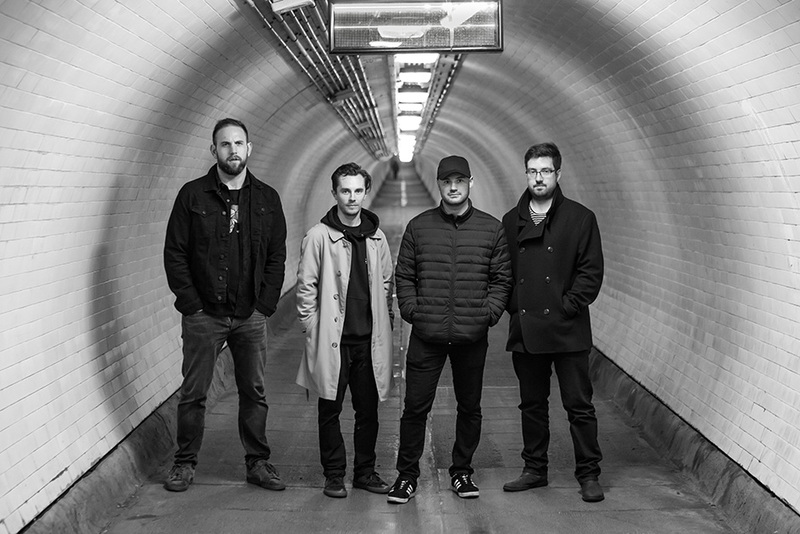 James and Guy caught up with Colin Noble on his ARfm show last night, speaking about the band's development over the past couple of years, 8th May and the forthcoming Night On My Mind EP. You can hear a clip below. 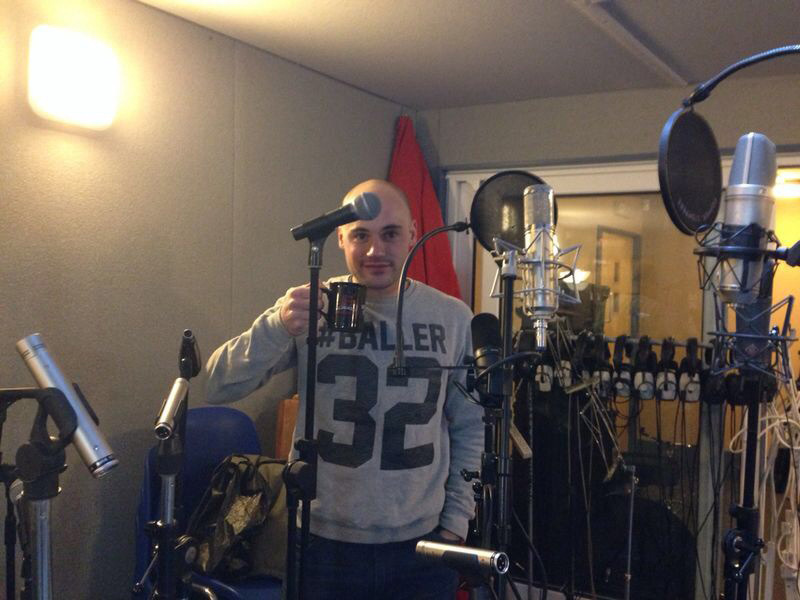 Darren Griffiths-Warner gave 8th May a spin on his GTFM show last night. Click below to hear a clip. 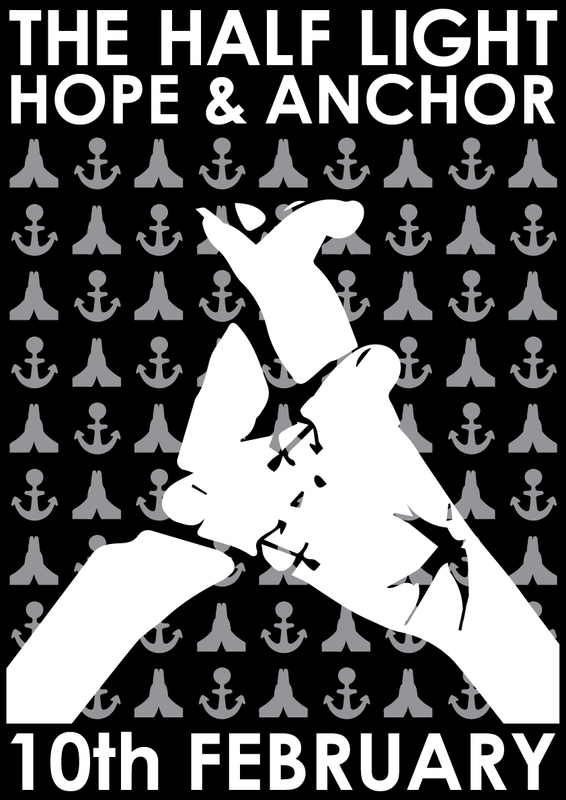 One week ahead of the 8th of May release, the shop has been restocked with new band logo and 8th may shirts. 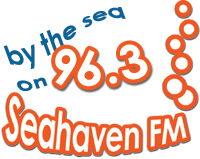 Roy Stannard had Simon Parker guesting on his Seahaven FM show last night. 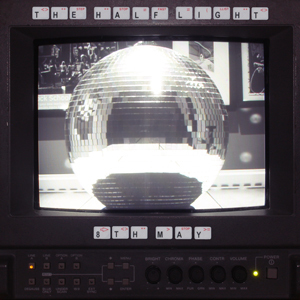 Click below to hear them both playing 8th May and discussing The Half Light's, 'twilight pop'. Chris Marchant joined the band during the recording of Night On My Mind and shot some great photos. You can check out more of Chris' work on his website and blog. 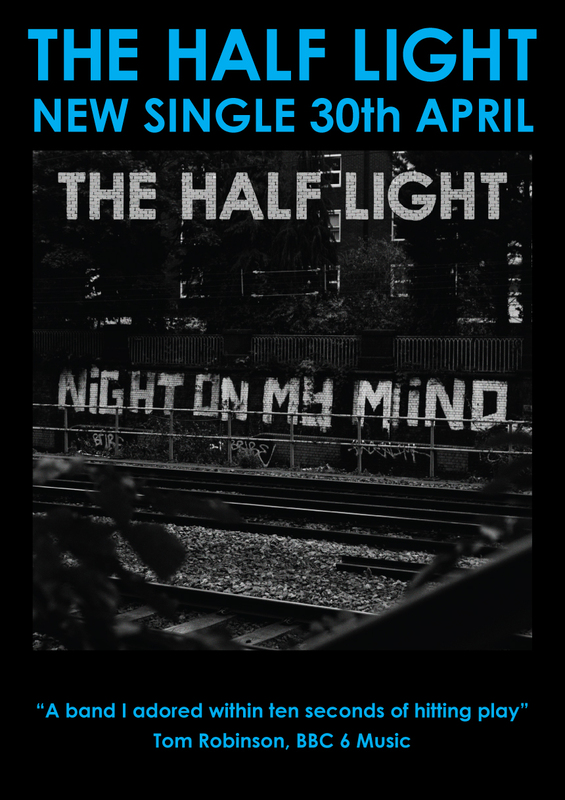 The Half Light are proud to annouce that their latest single, 8th May, which is taken from the forthcoming Night On My Mind EP, will be out on the 5th March. 8th May was recorded in December 2017 at Musicland Studios, Haggerston and was produced by Ian Flynn of Werkhouse. 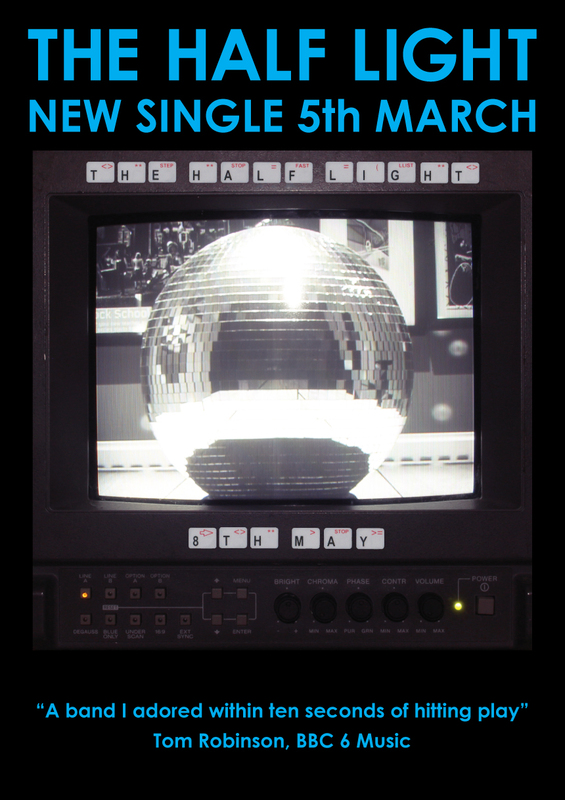 The release is supported by a gig at The Water Rats on the 10th March, more info in gigs. 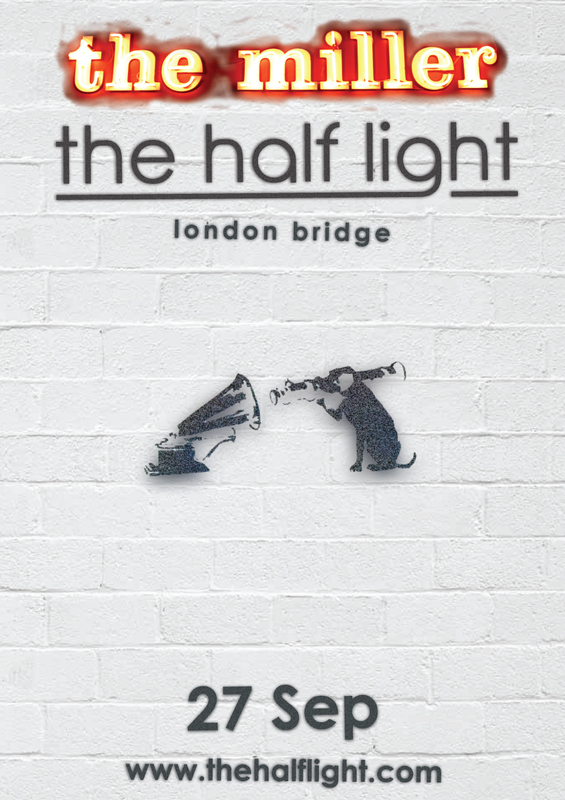 The Half Light are proud to annouce that their next gig will be at The Islington. This prestigous London venue has previously played host to Thurston Moore, Sarah Neufield (Arcade Fire) and The Magic Numbers so it is sure to be a good one. More info in gigs. 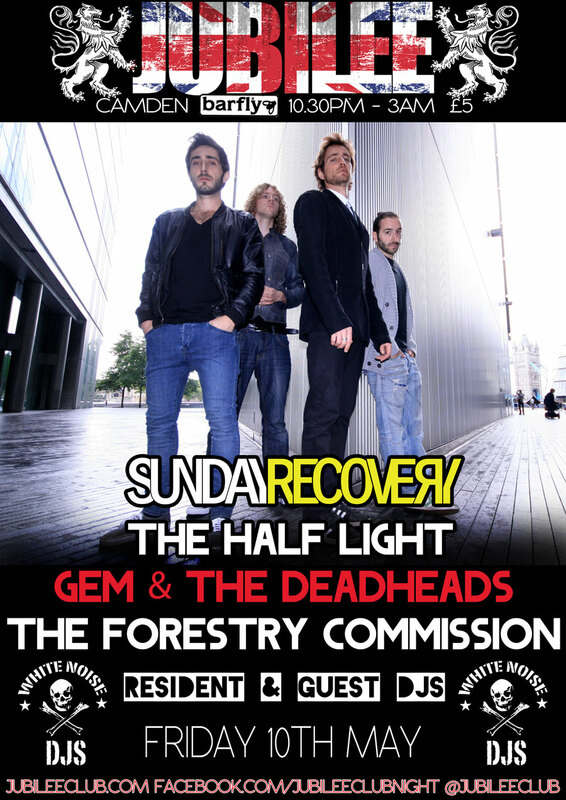 The Half Light return to the site of their very first gig on Saturday 15th of July. More info in gigs. 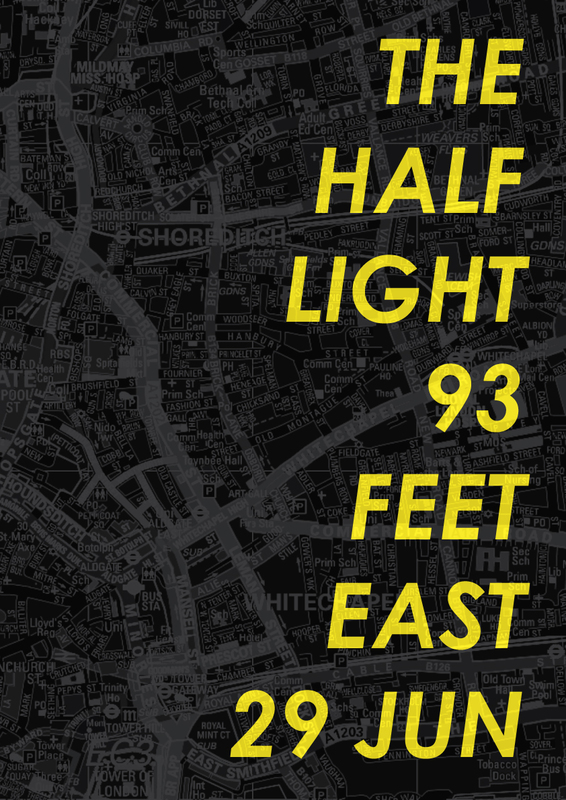 The Half Light are pleased to announce their inaugural performance at East London’s iconic 93 Feet East on Thursday 29th of June. Radiohead famously launched their pay-what-you-want In Rainbows with an intimate performance at the Brick Lane venue back in 2008, but you can expect no such fiscal irresponsibility from The Half Light - it’s six pounds on the door. 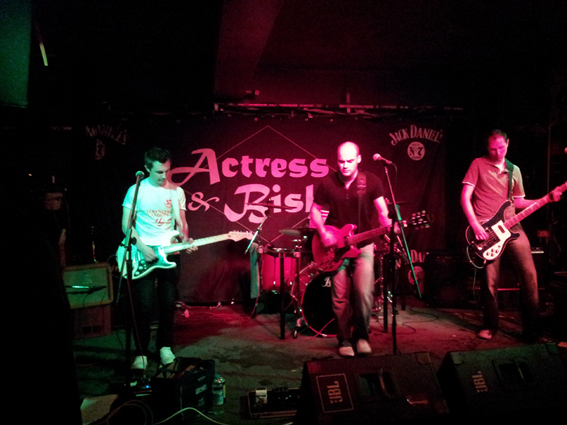 The Half Light return to The Bread & Roses on April 22nd. 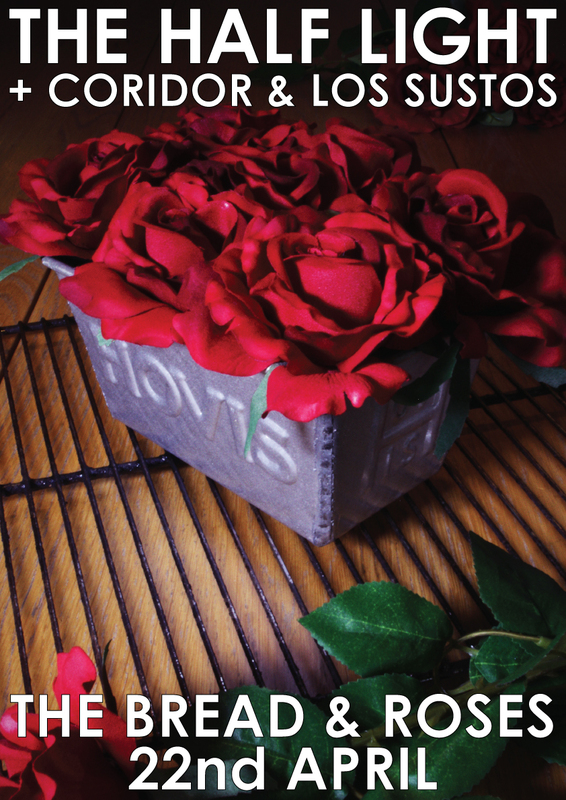 Hearts starve as well as bodies; give us bread, but give us roses!" 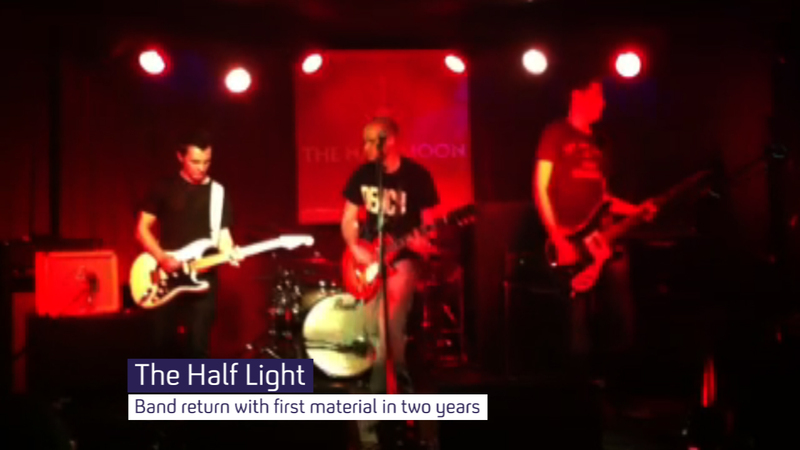 Almost a year since they last graced a stage, a grateful London welcomes The Half Light back to the live circuit. Boasting a new drummer, new songs and the same quality banter, this is one not to be missed. More info in gigs. 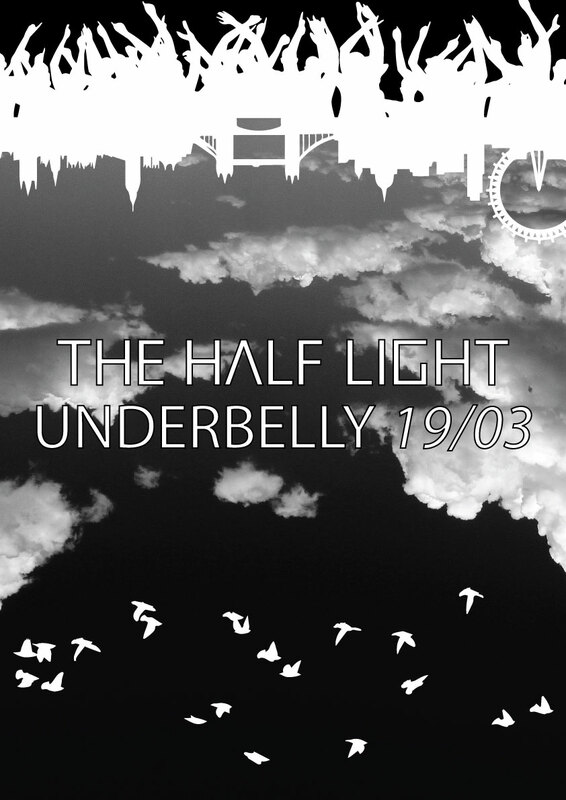 Next March The Half Light make their triumphant return to the Underbelly in Hoxton. More info in gigs. Stephen Vincent took some fantastic photos at last week's Barfly gig. Check them out in photos. Happy New Year! 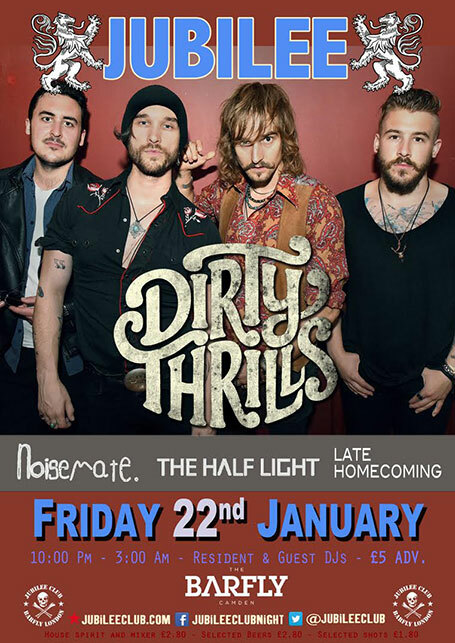 Get ready to break all your resolutions at The Half Light's first gig of 2016 at Camden's iconic Barfly on January 22nd. More info in gigs. 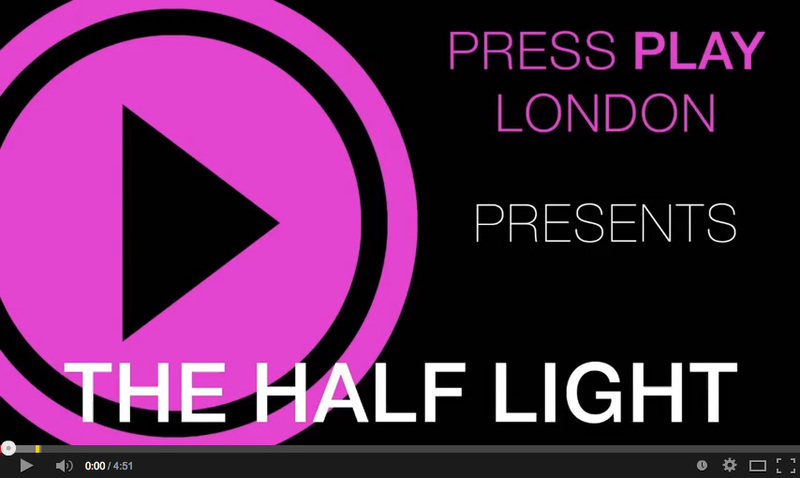 The Half Light return to the live circuit with their new line up on November 27th at The Comedy, Leicester Square. More info in gigs. Our new video for 1x1 documents the two wild weekends we spent in the studio with Darren Lawson for the Moscow sessions. Behind the scenes studio antics abound! 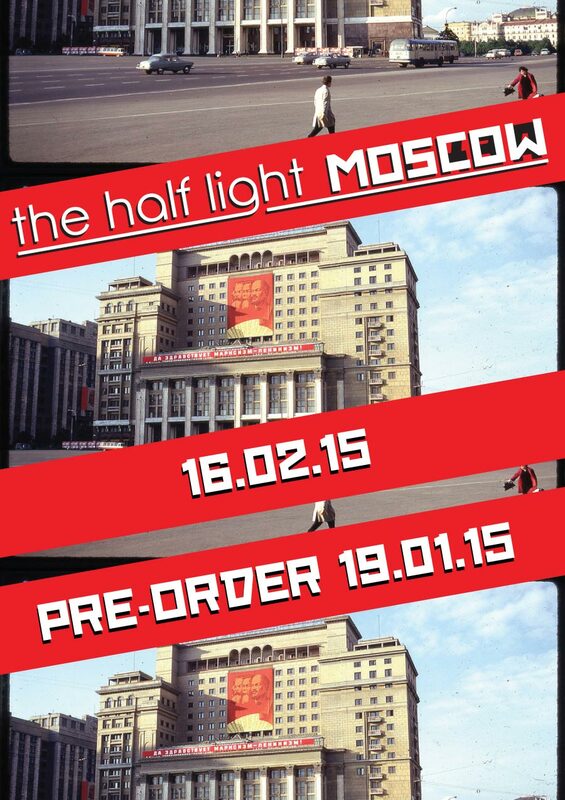 You can buy 1x1, along with Moscow, on iTunes and Amazon MP3. It was a big weekend for 1x1 airplay with Colin Noble kicking things off on Friday's Unsigned Show on ARfm, Jon Kelly giving it a spin on his Orange Flavoured Pipe Machine on Sine FM and finally, Aaron Phillips playing us on his Amazing Radio Rock Show on Saturday night. You can hear all the clips in press. 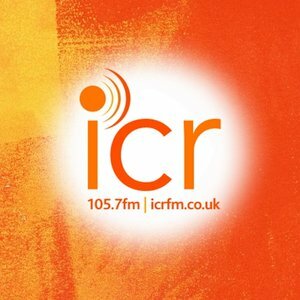 Steve Hicks played 1x1 last night on his Roll On show on ICR. You can hear a clip in press. 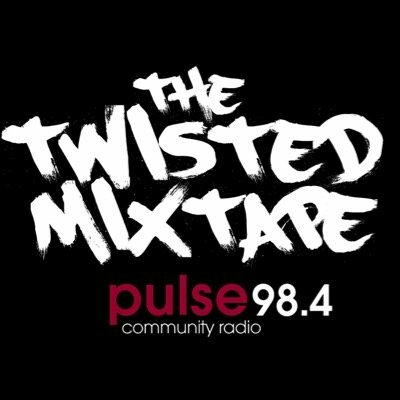 Kara and Calum gave Moscow another spin on their Twisted Mixtape last night, although we think they may have meant to play 1x1! (Joy Division anyone?) We appreciate the support regardless and you can hear a clip in press. Pure M kicked off the coverage for 1x1 with their review today, you might even be able to catch a sneaky look of the video ahead of it's official launch on the 11th of May. A stream of the song follows the cover art below...Enjoy! 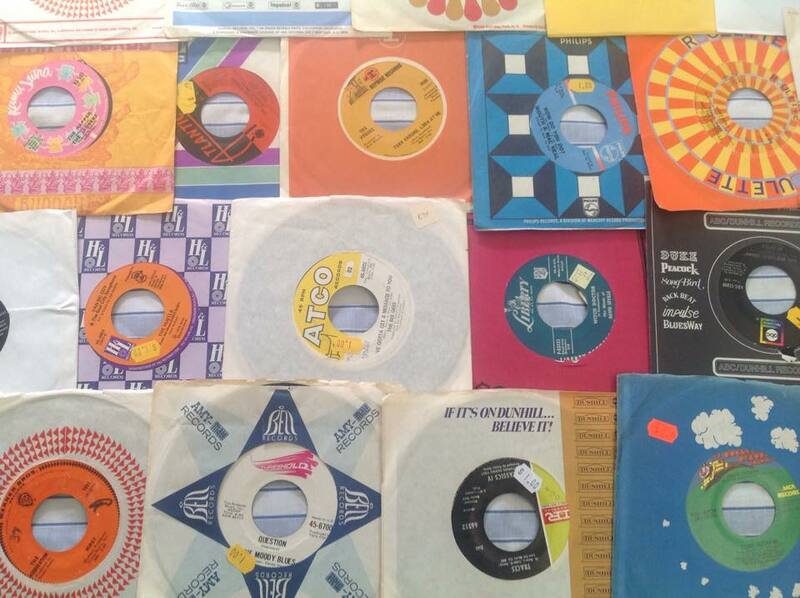 Trev and Ben were digging in The Half Light crates yesterday, giving Shadows a spin on their Croydon Radio show. You can hear a clip in press. 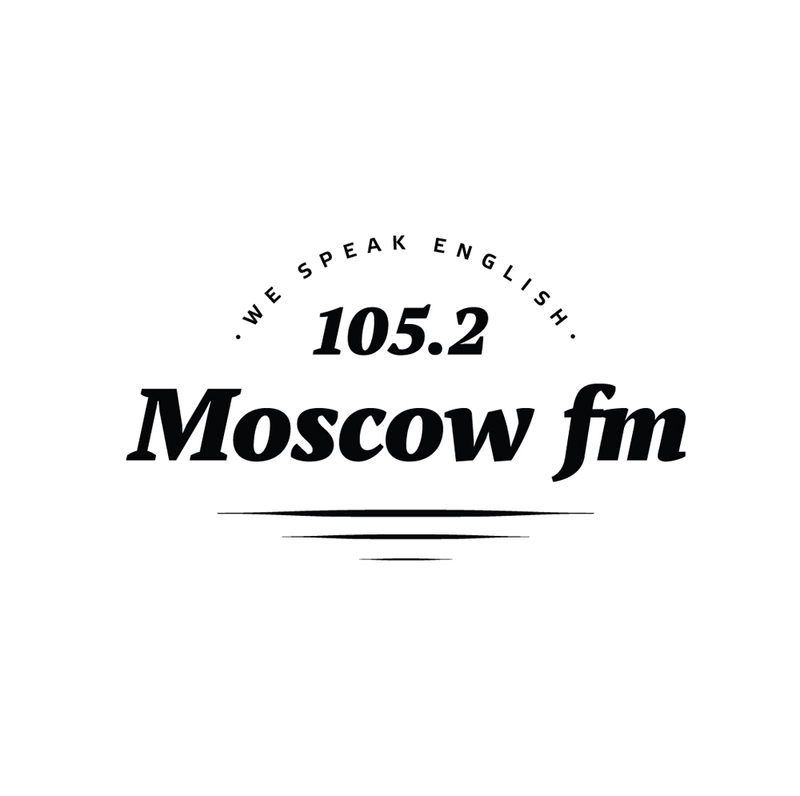 Moscow travelled two thousand miles east yesterday for a play in it's home city on Moscow FM. 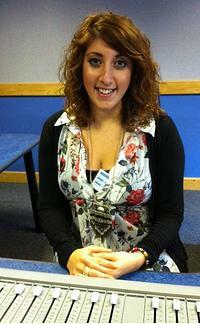 Big thanks to everyone at the station, but especially Katerina Kozlova who worked very hard to make it happen. Click press for a clip. 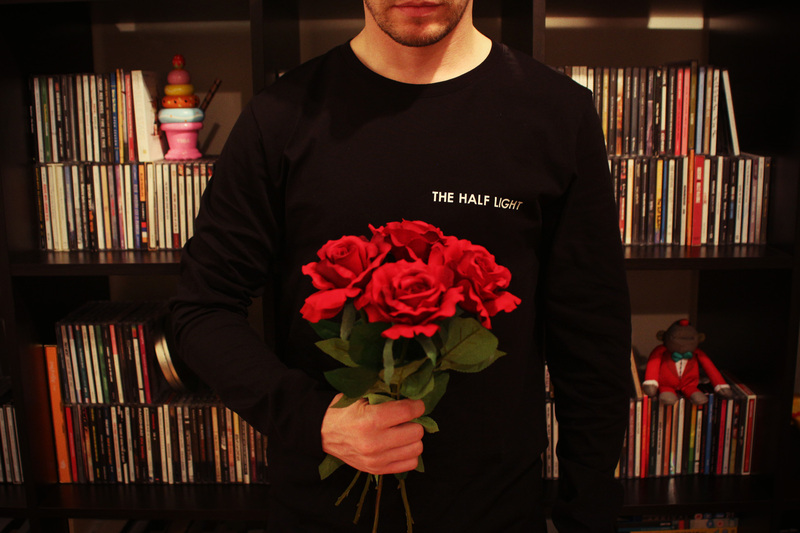 The Half Light took a trip across the pond last night as Robert F. Galgano gave Moscow a play on his New Jersey All Over The The Place Radio show. Click press for a clip. James and Guy popped in to speak to Tom C on his Croydon Radio show yesterday. 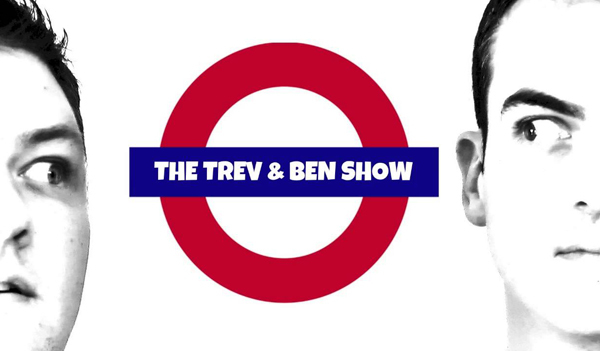 Click press for stories, banter and some terrible maths! Colin gave Moscow another play and spoke a little about coming to see us at The Pilgrim on his ARfm show last night. You can hear a clip in press. Kara and Calum gave Moscow a spin on their Twisted Mixtape last night, you can hear a clip in press. 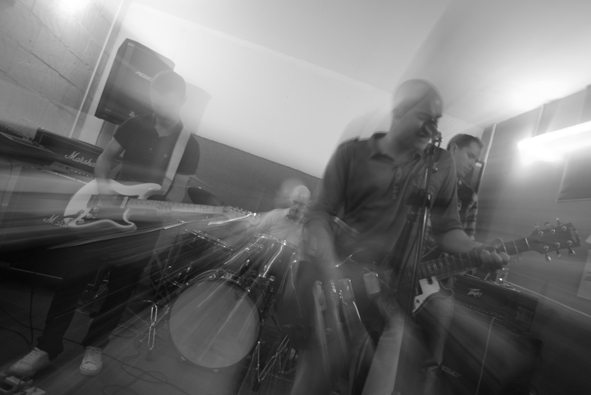 Markus Steitz took some great photos at last week's gig at The Pilgrim. Big thanks to everyone who turned out. Our final photo story looks at the images used on the Moscow CDs. Alternative Tracks have posted the following review of Moscow. 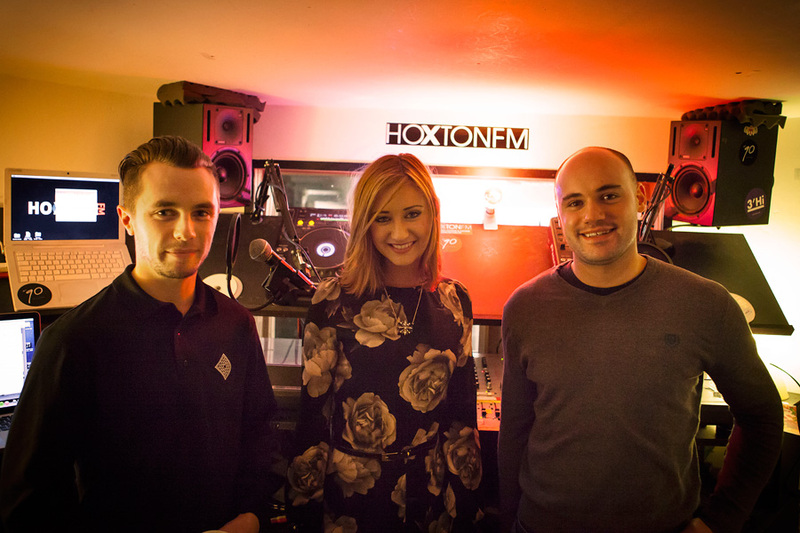 The ever reliable Chris Marchant came along to the Hoxton FM interview last week and took some fantastic photos. You can hear the interview in press. We take you behind the scenes of the production of the Moscow video with the footage used from the seminal Saturday Night and Sunday Morning. The second of our short photo features, this time looking at the back cover, is now online. 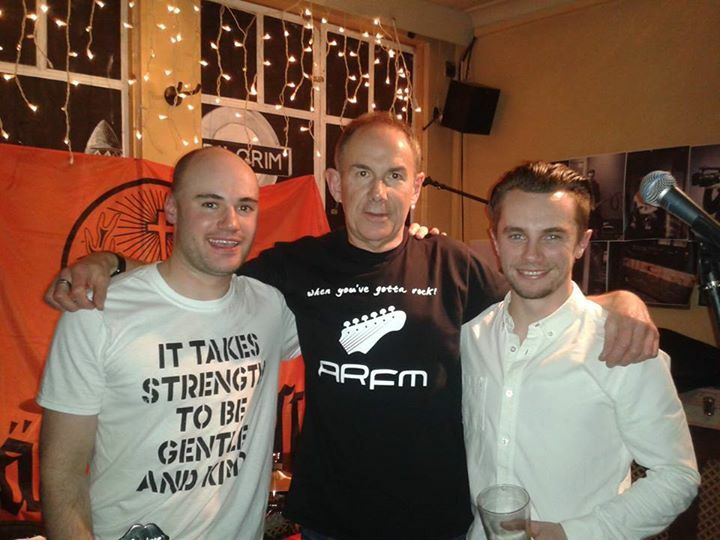 James and Guy spoke to Colin Noble on his ARfm show last night. You can hear a clip in press. Moscow has been played out across 80 stations in 15 countries over the past week as part of Matt Graveling's Best of British Unsigned. You can hear a clip in press. PressPlay UK have featured Moscow on their You Tube channel. The rain fell hard on a humdrum town last night as the players of Manchester United travelled forty minutes up the M61 to North West rivals Preston. As the Red Devils slipped a goal behind at Deepdale, back home, Callum Mitchell was playing Moscow on their local station, Salford City Radio. You can hear a clip in press. #moscowmonday is here! Take a look at the video, order a copy, and don't forget about the gigs this weekend. Happy #moscowmonday! Moscow merch has arrived! Have a look in the shop to place your order. Roy Stannard gave Moscow a spin in amongst his alternative Valentine's Day special on Seahaven FM last night. You can hear a clip in press. Another GB nation ticked off as Phil Huntley gave Moscow at spin on his Radio Tircoed Off The Radar show last night. You can hear a clip in press. 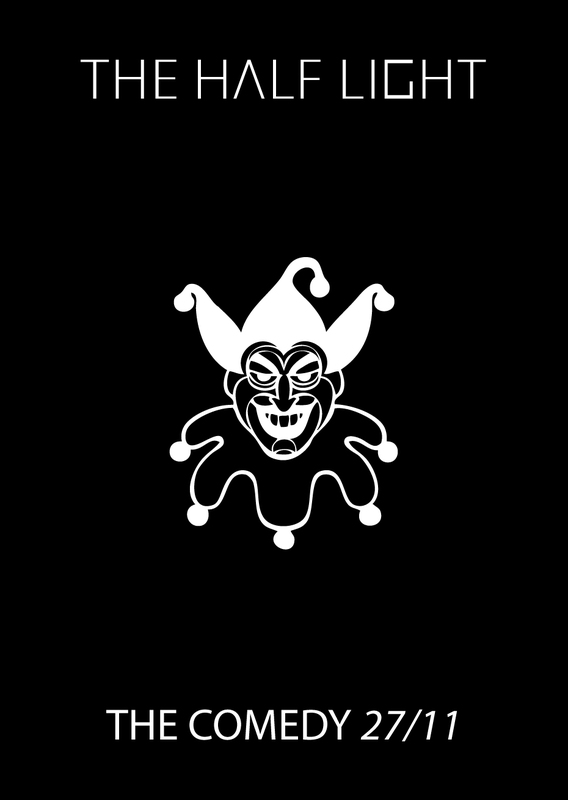 Following Friday's play, Moscow will be rubbing shoulders AC/DC, Jool's Holland and the Prodigy as it goes into general rotation all this week on Nevis FM. Big thanks to John and all the Nevis team. With just a week to go until #moscowmonday, here is a short photo feature on the artwork used on the front cover. A few more snaps that the band took during recording on their phones. John Weller gave Moscow it's first spin north of the border on his Nevis FM Drivetime show last night, and this was then followed up by a return south and a play on Bill Horncastle's The Fox's Den on Vixen 101. You can hear clips of both in press. 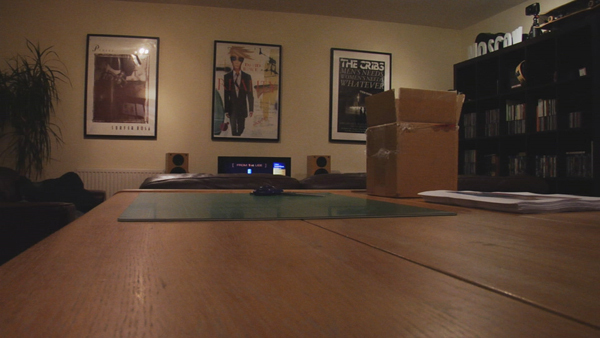 Some more of Chris Marchant's photos are up now, this time from Stephen Street's The Bunker studio. You can check out more of Chris' work on his website and blog. 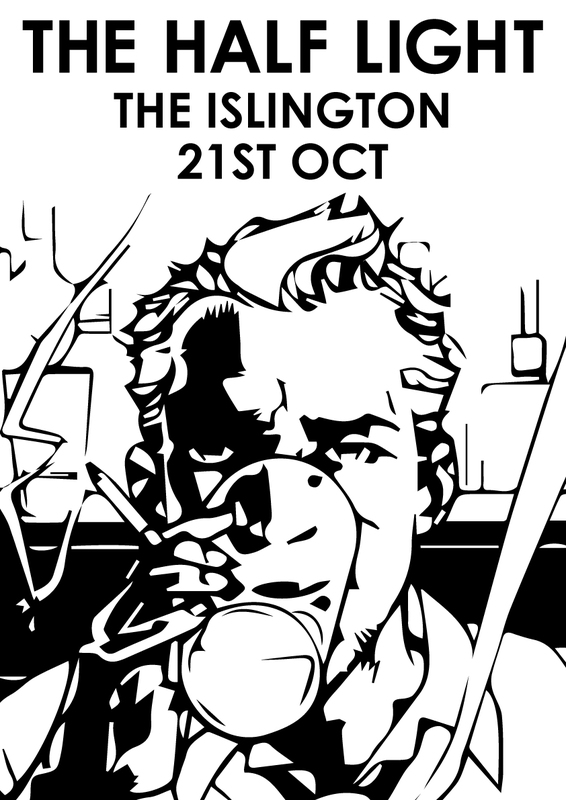 The Half Light return to the site of their very first gig on Friday the 20th. More info in gigs. 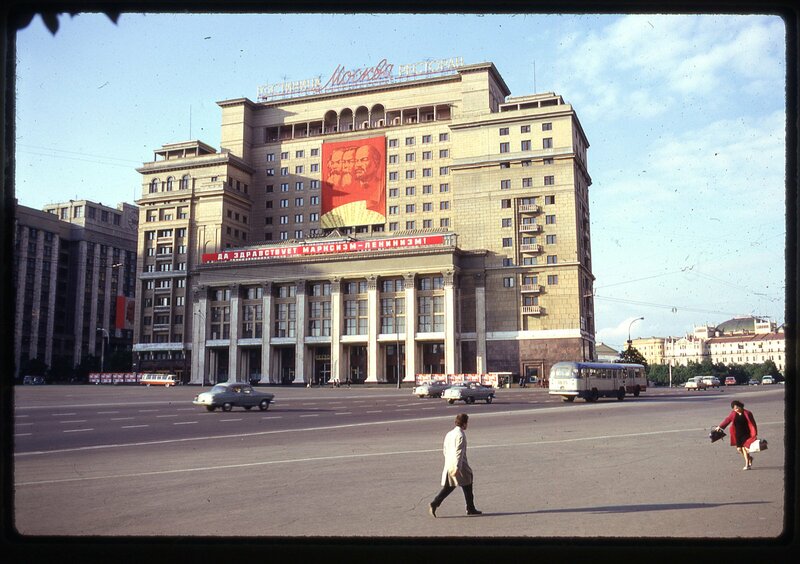 Tim Willett played Moscow on the New Music Generator on Cambridge 105. You can hear a clip in press. 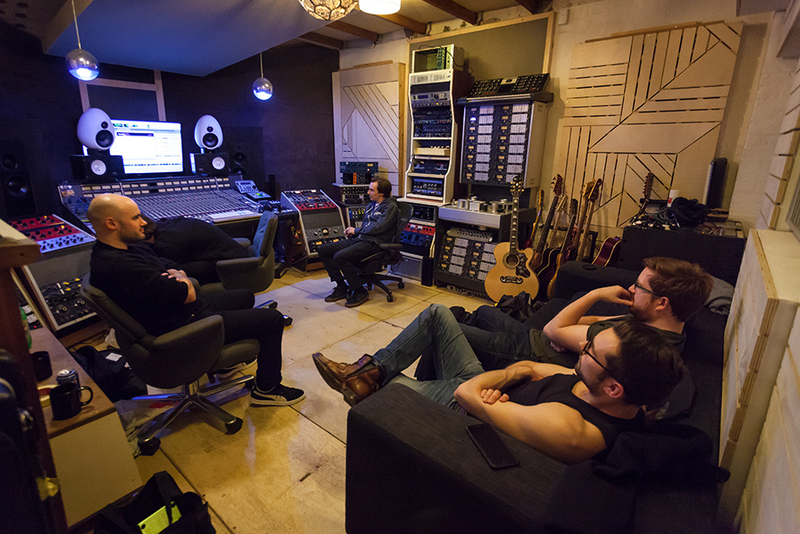 Chris Marchant shot some great photos last year during the Moscow recording sessions, the first batch of which, from Perry Vale Studios, are up now. You can check out more of Chris' work on his website and blog. 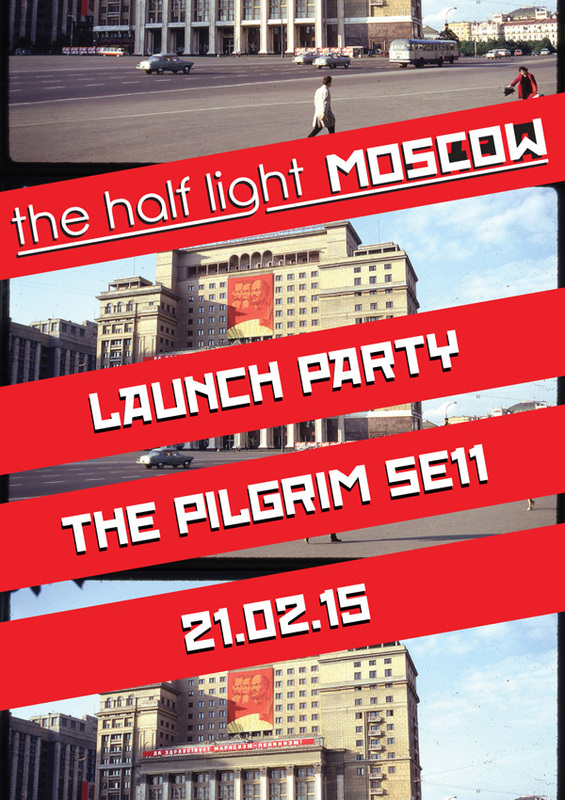 The Half Light launch Moscow at The Pilgrim in Kennington on Saturday 21st February. Birmingham band Nine Dart Finish and Stu Rawle support. More info in gigs. The record is available to pre-order now from Amazon. Click here to view the teaser video. Colin Noble gave Moscow a spin on his ARfm show last night. You can hear a clip in press. Moscow is available to pre-order now from Amazon. Click here to view the teaser video. 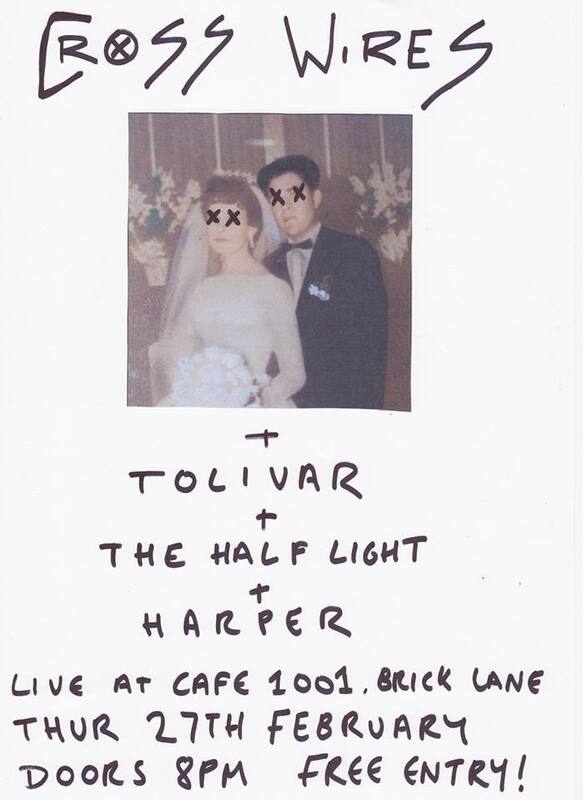 The Half Light return to The Fiddler's Elbow on Thursday 29th. More info in gigs. 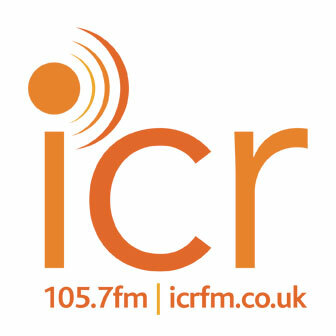 Steve Hicks has played Moscow a couple of times on his ICR show over the last two weeks. You can hear clips in press. 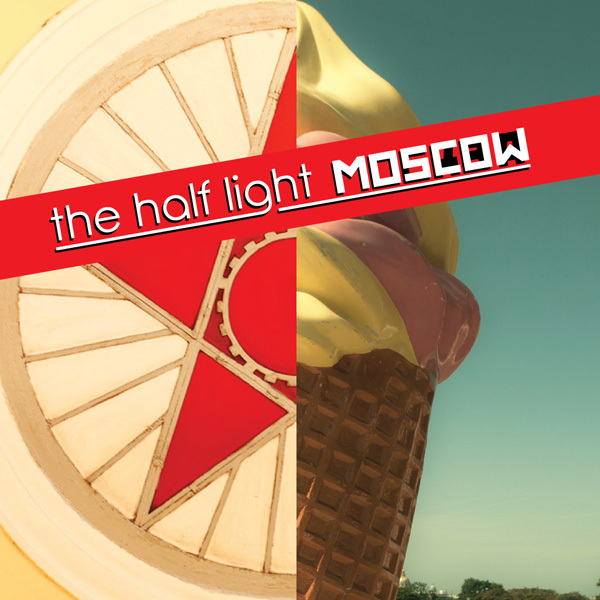 The Half Light are proud to announce that their latest single 'Moscow' will be out on the 16th of Feb, with pre-sale starting on the 19th of Jan. XRP gave the record an early spin last night and you can read Pure M Magazine's review here. A stream follows the poster...Enjoy! 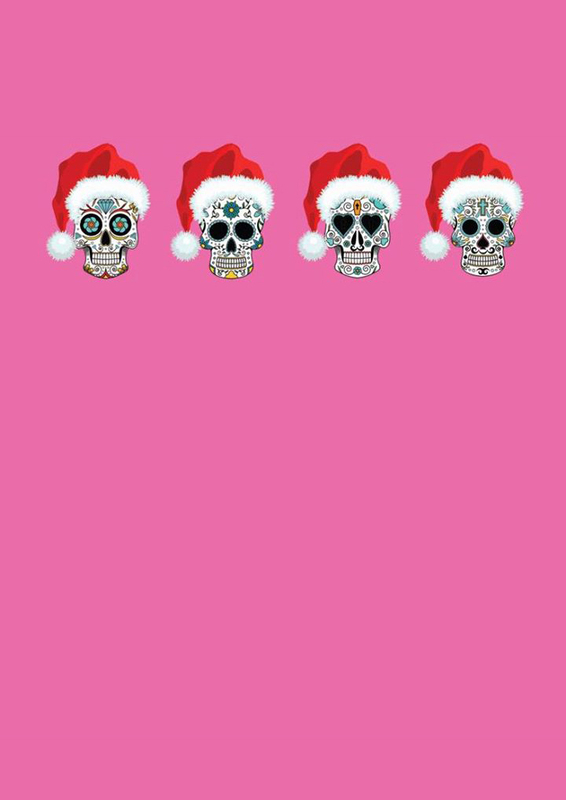 The Half Light are closing out the year with the The Unmentionables at their Christmas Party. More info in gigs. After a six month hiatus, almost to the day, The Half Light return to Shebang's night at The Fiddler's Elbow this Thursday, with our new bassist Pilo in tow. Come and check out the new line up! More info in gigs. 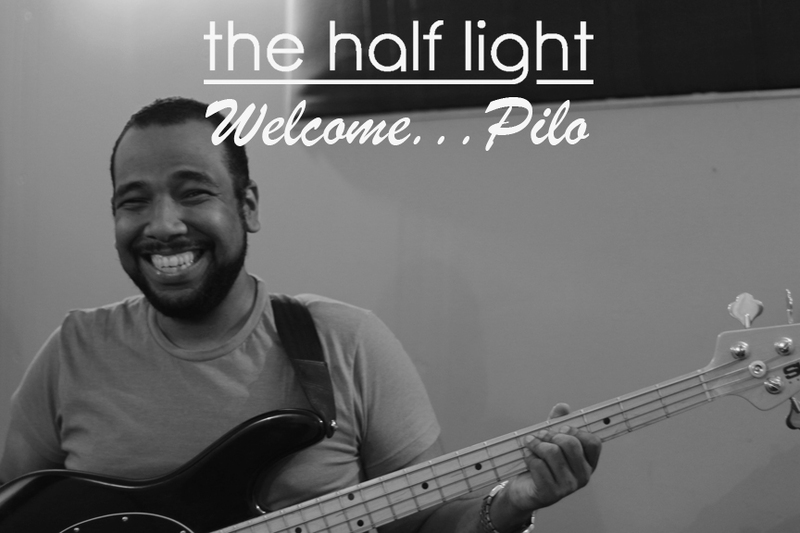 The Half Light are proud to introduce their newest member, Pilo. Welcome to the gang mate. 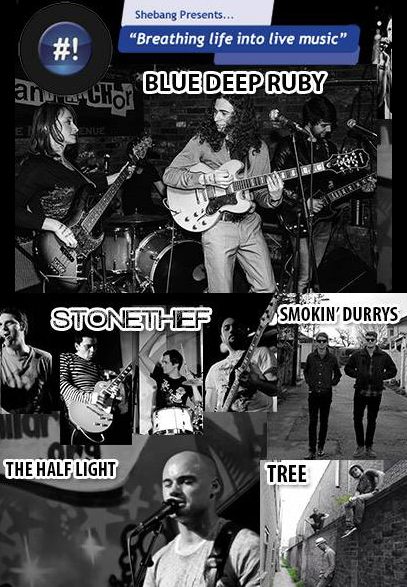 The Half Light join forces once more with Shebang Presents and Stu Rawle for a gig this Thursday at The Fiddler's Elbow, Camden. More info in gigs. 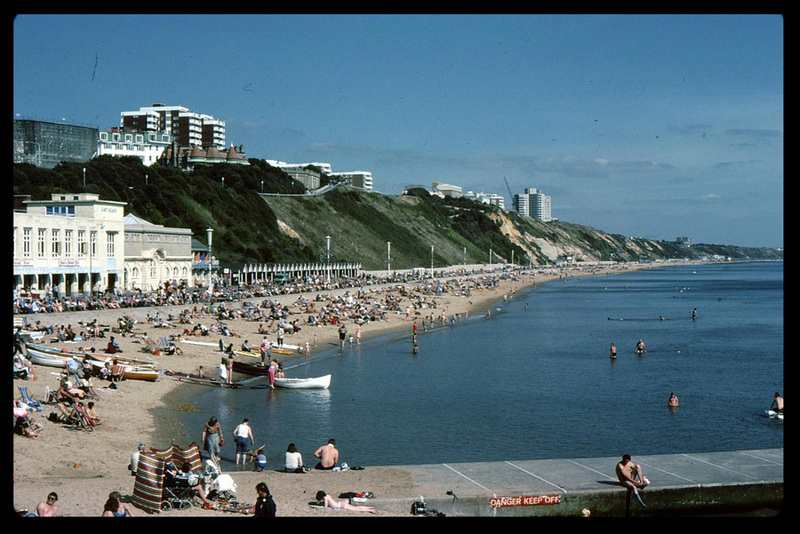 The Half Light crossed the Channel last night as Ralph dropped Stone's Throw into his Indie Mix last night on Radio KC, you can hear it in press. 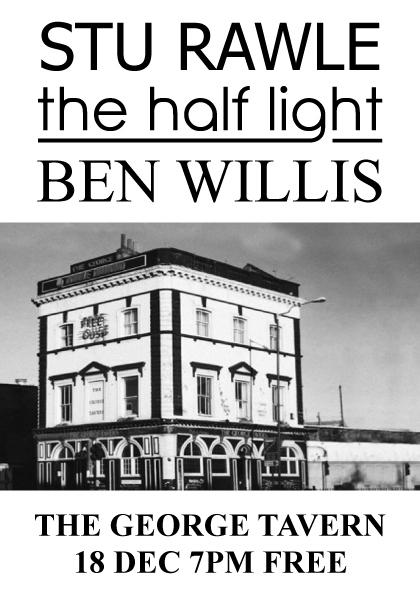 The Half Light team up with friends-of-the-band Cross Wires for their EP launch at the end of the month, more info in gigs. Jay Adkins gave Clapham a play as part of last night's 2013 best of show on NUA, you can hear it in press. 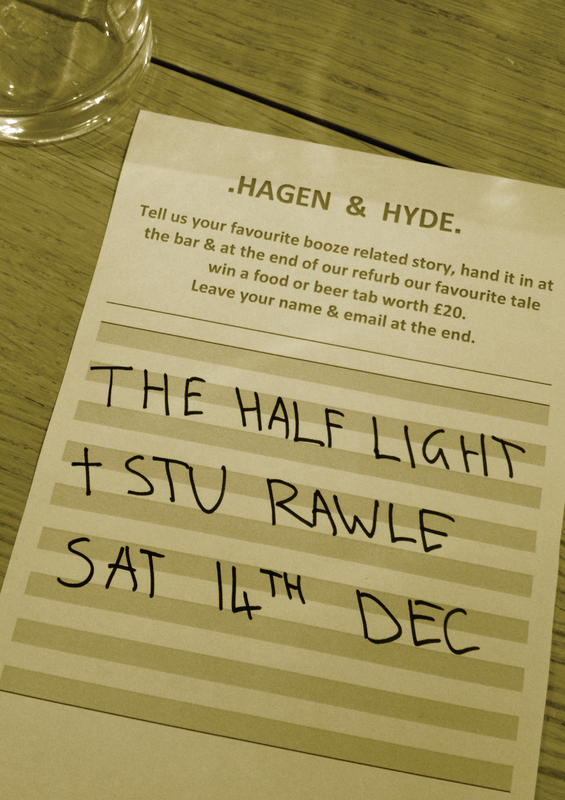 The Half Light reunite with Stu Rawle for another night of South London carnage at the Hagen & Hyde, more info in gigs. 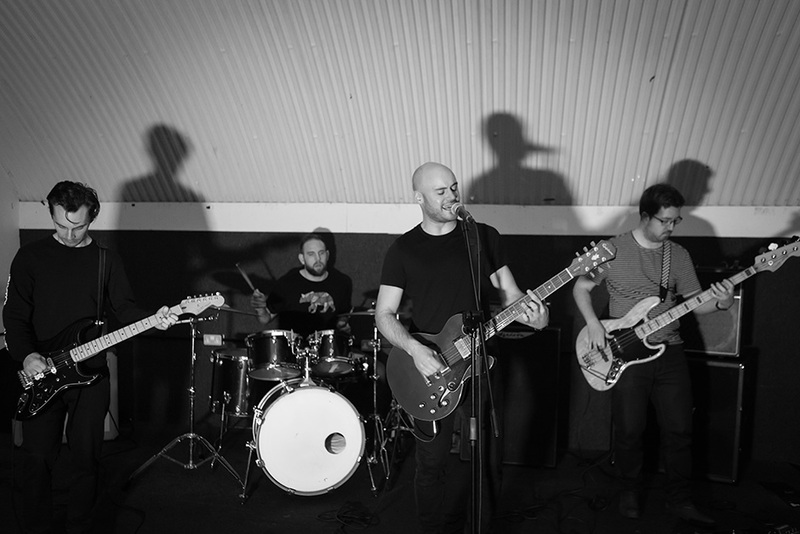 The Half Light captured some of Birmingham's downfall in this tour video. 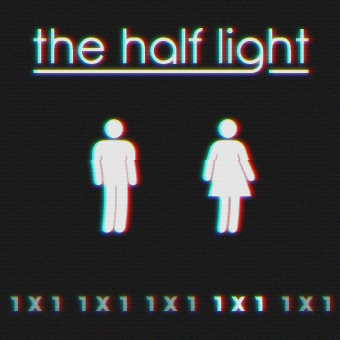 Red Dragon Records have featured The Half Light on their latest compilation. 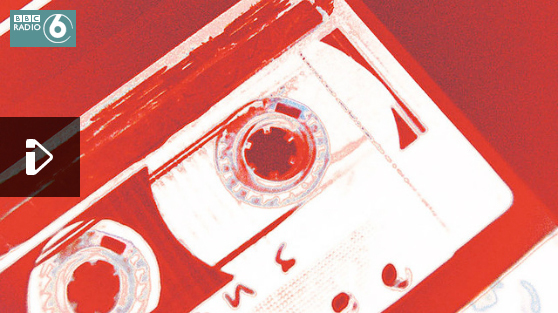 You can buy the record on Amazon and iTunes, or check out the Red Dragon website here. 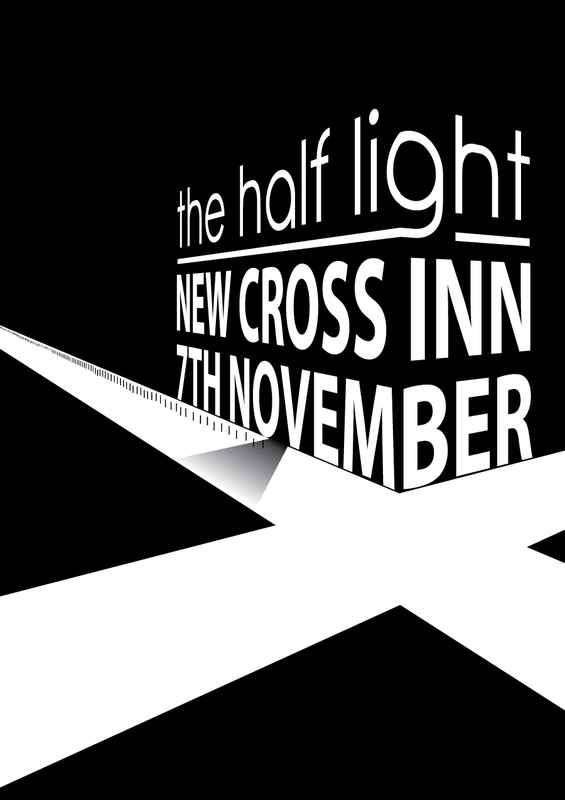 The Half Light play New Cross Inn's student night on Thursday 7th October. Students free, £3 for everyone else. 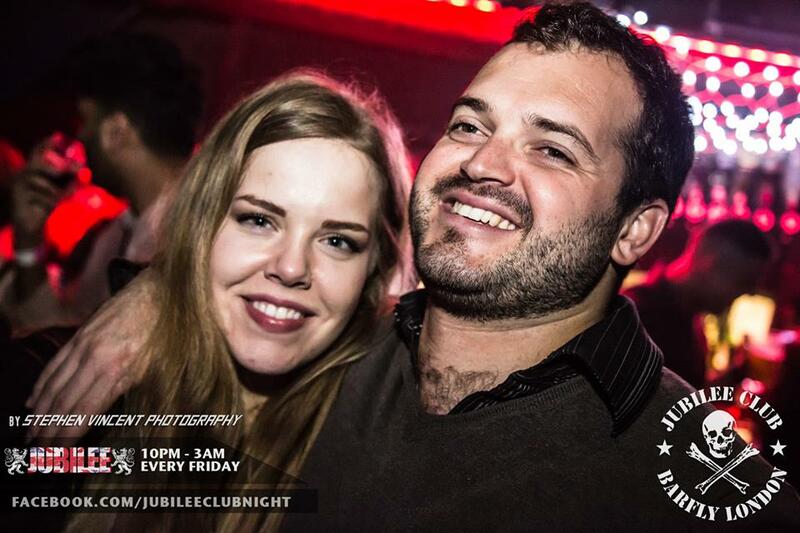 £2 Beers, £1 shots and £3 J Bombs all night. If that hasn't persuaded you, there's more info in gigs. 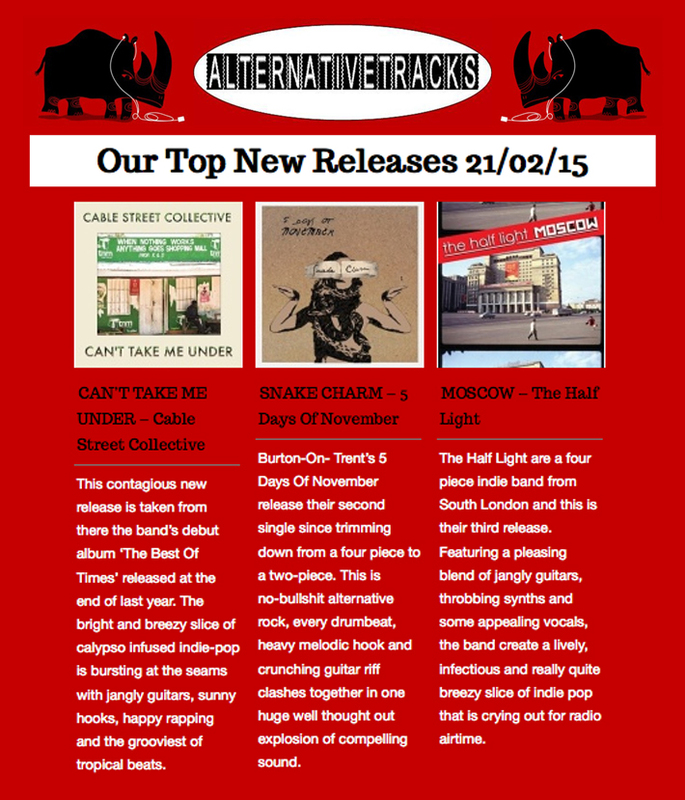 The Half Light channel their inner Mancunian miserablists with this There Is A Light cover from the Barrel and Horn. 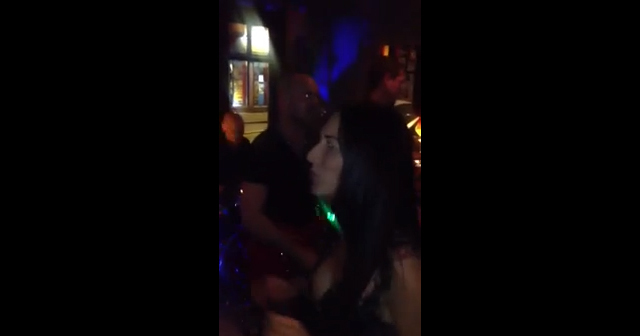 Video kindly provided by Dave Humphrey. Mark Wincott wrote a couple of paragraphs about The Miller performance in the October issue of Love Music Magazine. You can read the article in press. 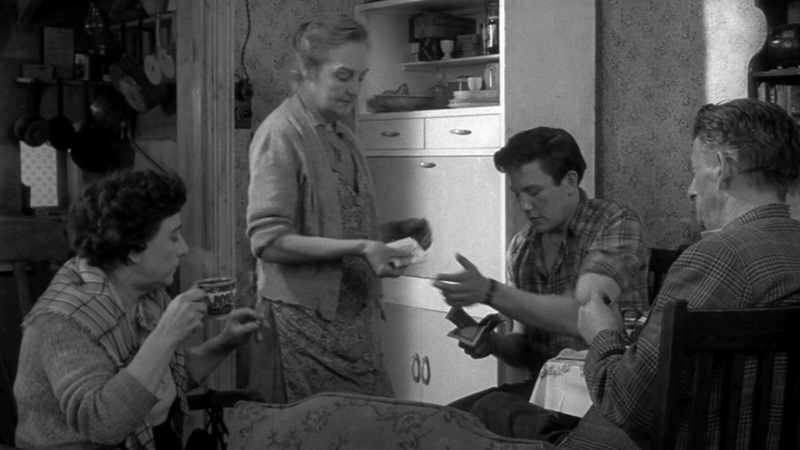 "One up the Brum, no harm done." 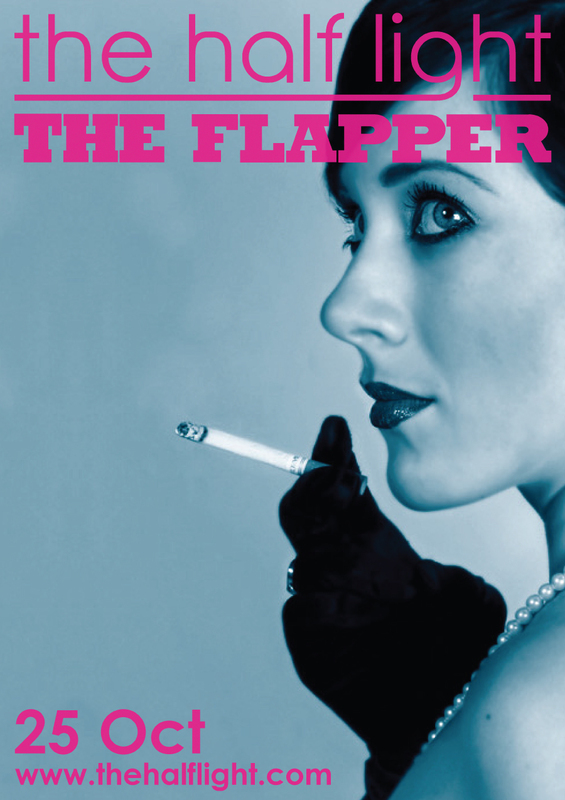 The Half Light kick off their annual weekend of Midlands destruction at Birmingham's The Flapper on Friday 25th October. More info in gigs. 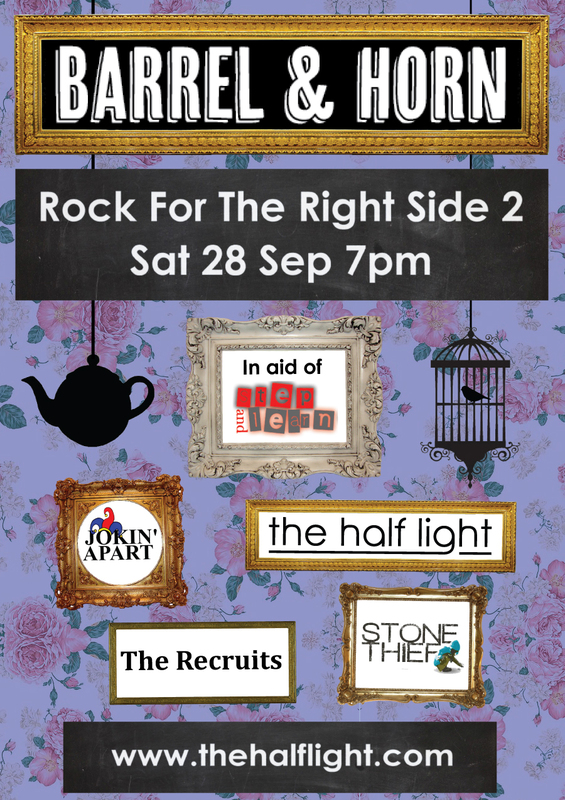 In what promises to be a big weekend of gigs, The Half Light will play London Bridge's The Miller on Friday 27th September and Bromley's Barrel and Horn on Saturday 28th as part of Rock For The Right Side 2. More info in gigs. 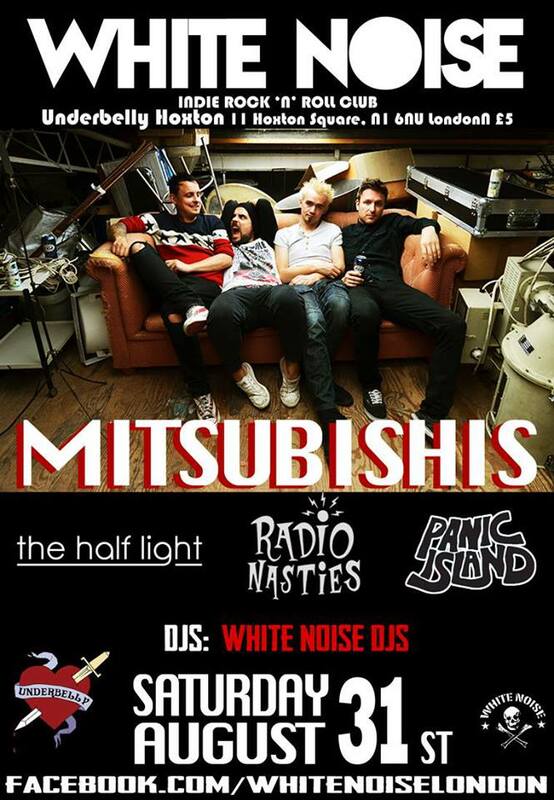 The Half Light are proud to announce that their next gig will be at Chris McCormack's White Noise at Underbelly on the last Saturday of this month. 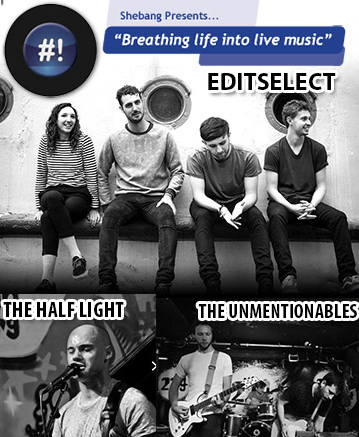 £5 gets you four bands, The Half Light at 9pm and indie tunes new and old from Chris until 3am. Should be a bit of a tear up. More info in gigs. 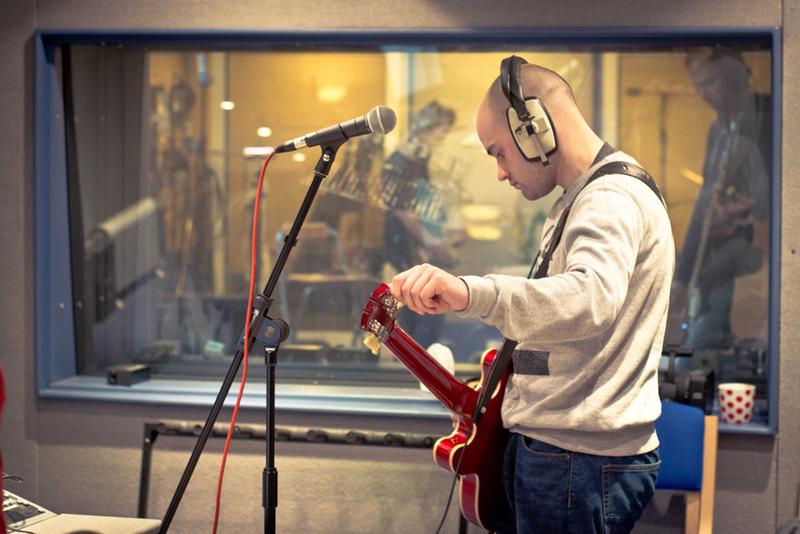 Jay Adkins played Clapham and Behind on last night's NUA show, you can hear it in press. Chris Marchant shot some great photos at Friday's White Lion gig. You can check out more of Chris' work on his website and blog. 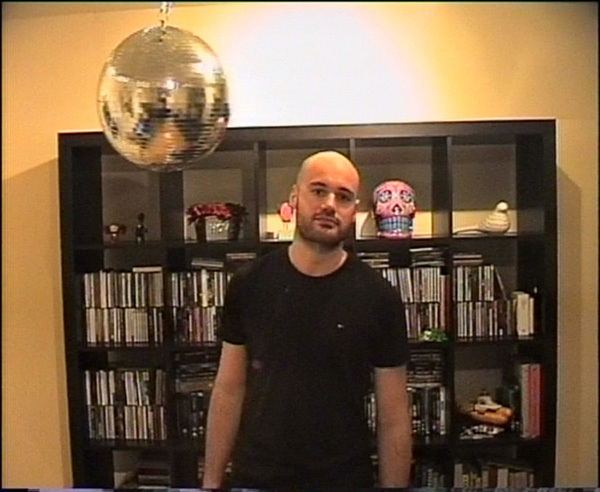 The Stone's Throw video is available now in videos. 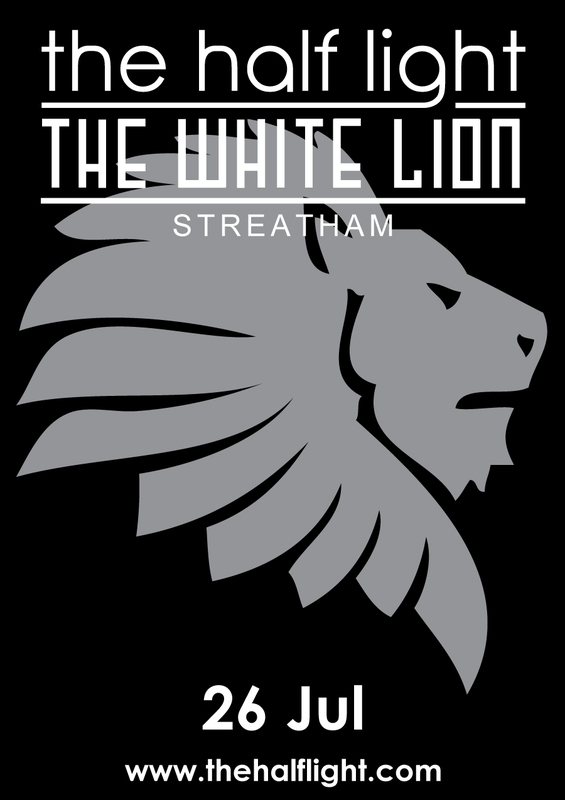 The Half Light are proud to annouce that their next gig will be on Friday 26th July at Streatham's White Lion. 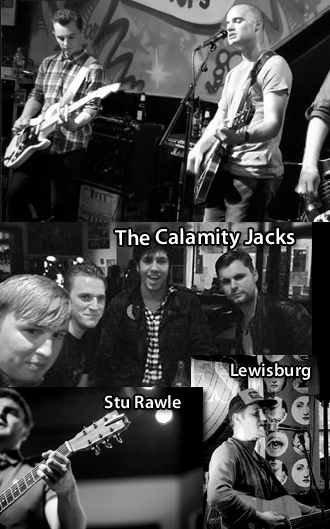 There will be four bands across the night, with the fun starting at 8pm. More info in gigs. Tom Du Croz played Clapham and spoke to The Forestry Commision on the London Gig Guide ahead of Friday's Barfly gig, you can hear it in press. Sine FM's Jonathan Jones gave Clapham a play on The First 45. You can hear it again in press. Tina Bass gave Clapham a second spin on The Launch Pad on Hermitage FM a couple of weeks ago, you can hear it again in press. SPGtv used If You Come To Clapham and Behind in the latest episode of Student Source, you can watch the show in press. If you missed The Half Light on Ipswitch Community Radio last night, you can hear it again in press. 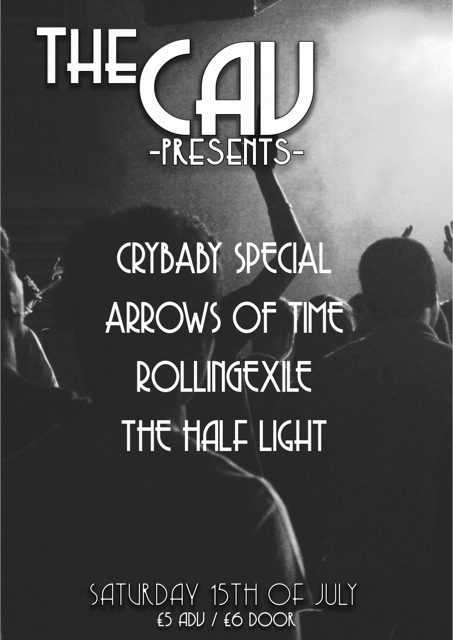 The Half Light are proud to announce that their next gig will be at Carl Barat and Chris McCormack's Jubilee Club at The Barfly. 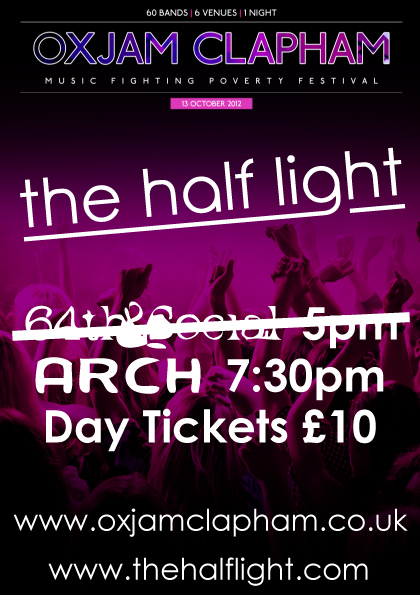 £5 gets you four bands, The Half Light at 12.15am, as well as resident (Carl and Chris), and guest DJs until 3am. Bring your dancing shoes! More info in gigs. Tina Bass made The Half Light her Unsigned Artist of the Week on this week's The Launch Pad on Hermitage FM, you can hear it again in press. 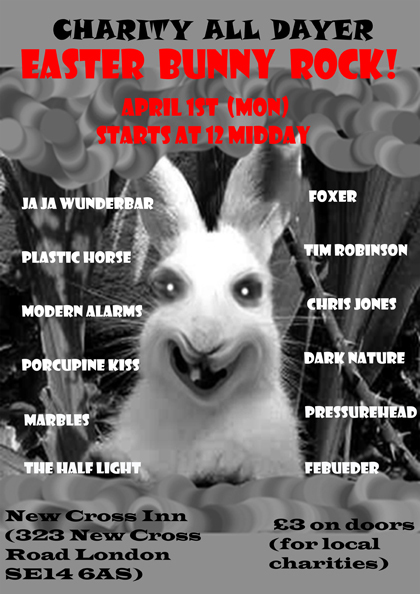 The Half Light will be playing at New Cross Inn's Easter Bunny Rock on Easter Monday. More info in gigs. If you missed The Half Light on Susie Lewis' Explosive Unsigned show this Sunday, you can listen to a clip now in press, or find out more about Susie's show here. Sign up to the Half Light mailing list using the box at the top of this page and recieve a free copy of Stone's Throw, the closing song from the Clapham EP. 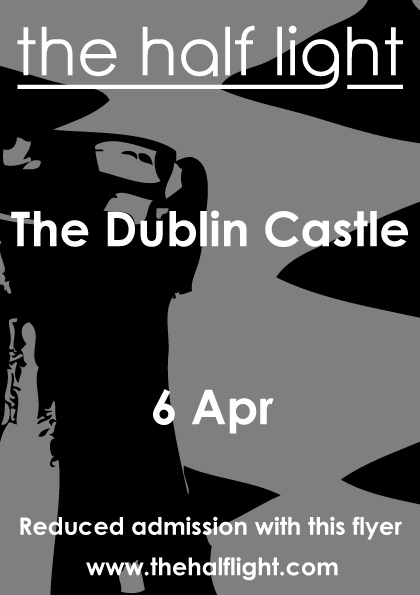 The Half Light make their live return on Saturday 6th April at The Dublin Castle. More details in gigs. 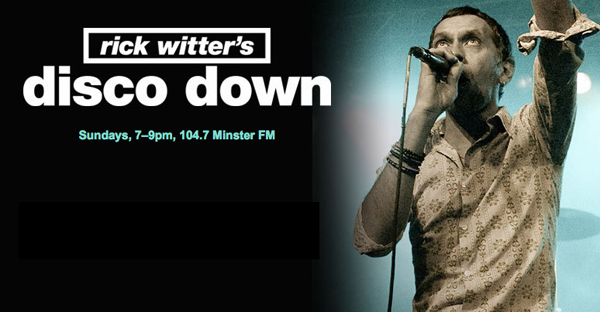 The Half Light broke their commercial FM duck last night with a spin on Rick Witter's Disco Down on Minster FM. If you missed it, you can listen to the highlights in the press section, or find out more about Rick's show here. 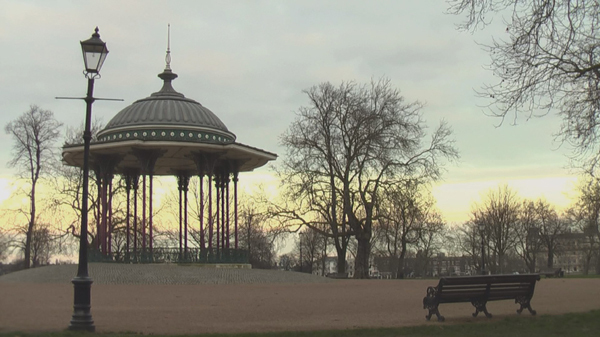 The video for If You Come To Clapham is available now in videos. 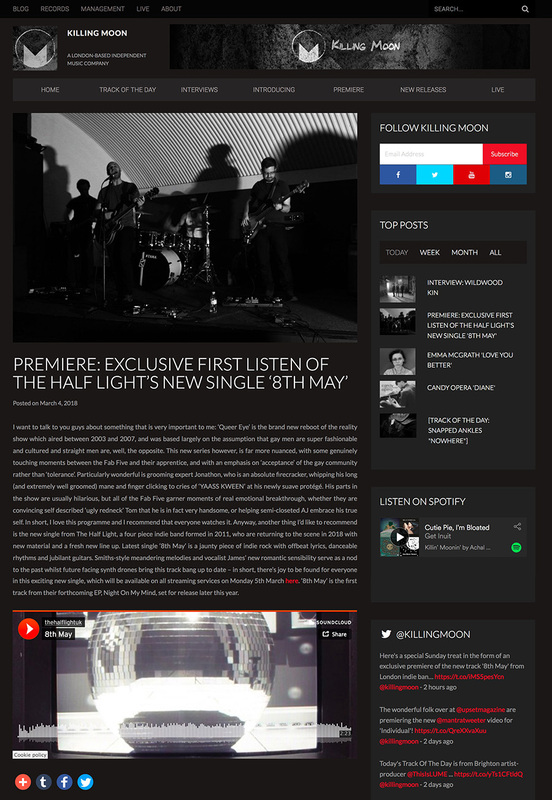 The Half Light got their second spin on Gary Crowley's BBC London Introducing show last night. 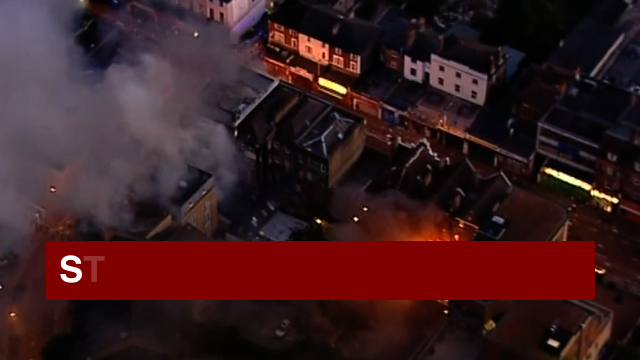 If you missed it, you can catch up over the next seven days here. If You Come To Clapham is second up in the Introducing hour, just past 1:05:30 in. Just ignore the bit about a gig we're not playing at The Barfly! 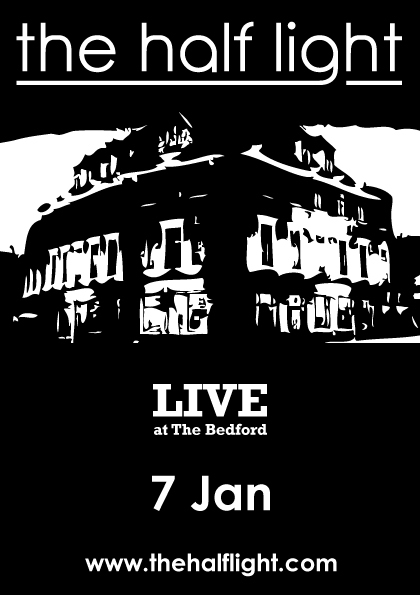 The Half Light's first gig of 2013 will be at The Bedford, Balham on Monday 7th January, more details in gigs. 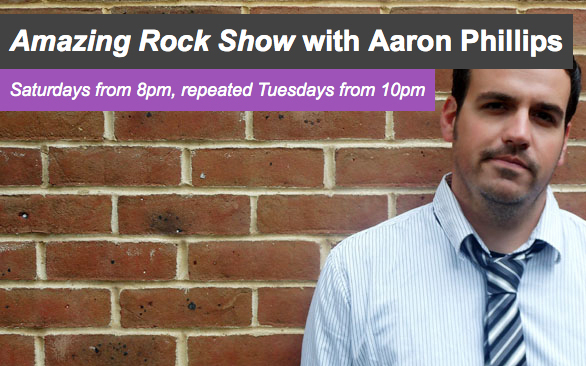 If you missed The Half LIght on Aaaron Phillips' Amazing Radio Rock show this weekend, you can now catch up on their site here. The Half LIght featured on Tom Robinson's BBC Introducing Mixtape on BBC 6 Music in the early hours of this morning, you can catch up here. 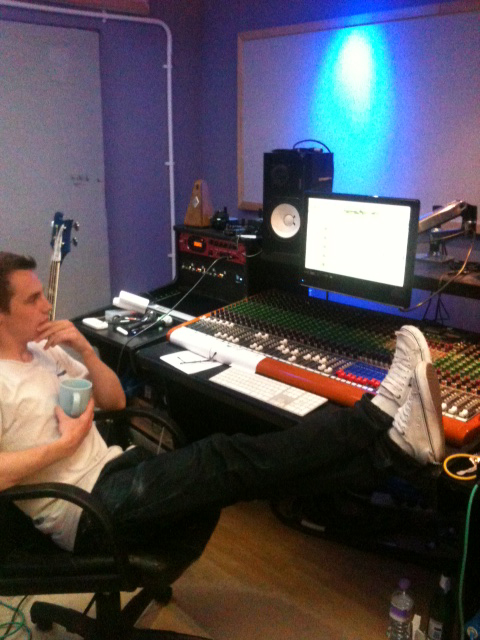 You can also read Tom's blog here, or download the mixtape here. Tom drops The Light just past 46:17. If you missed The Half Light on Gary Crowley's BBC London Introducing show last night, you can catch up over the next seven days here. The fun starts just past 1:39:00 in. 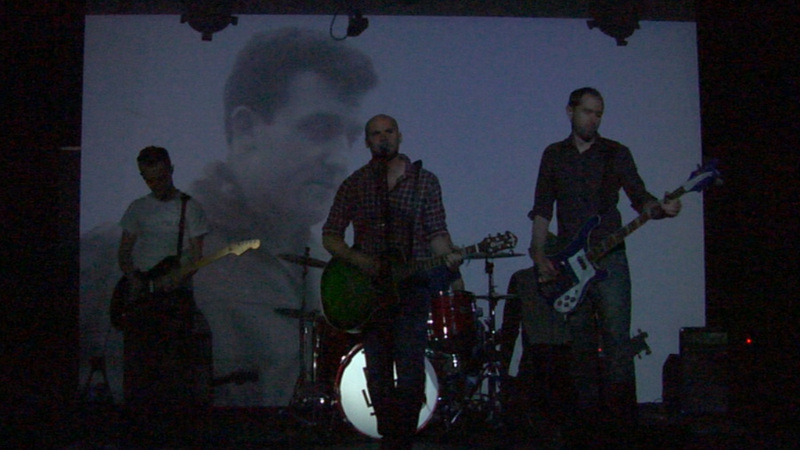 The Half Light support the fantastic Stu Rawle at iconic East London venue The George Tavern on Tuesday 18th December. 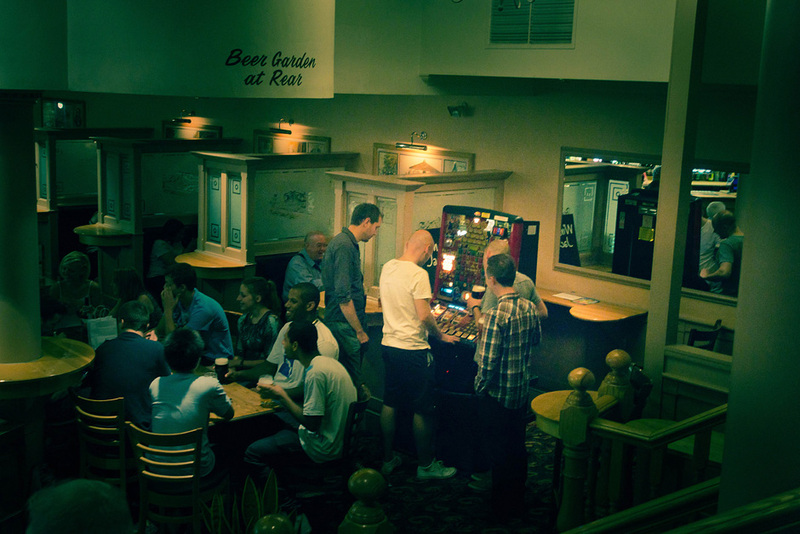 Having featured in the works of Chaucer, Pepys and Dickens, the venue has more recently played host to John Cooper Clarke, Plan B and The Magic Numbers. Ben Willis is joining Stu and The Light for what should be a cracking free night. You shouldn't need any more info, but if you do, you can find it in gigs. 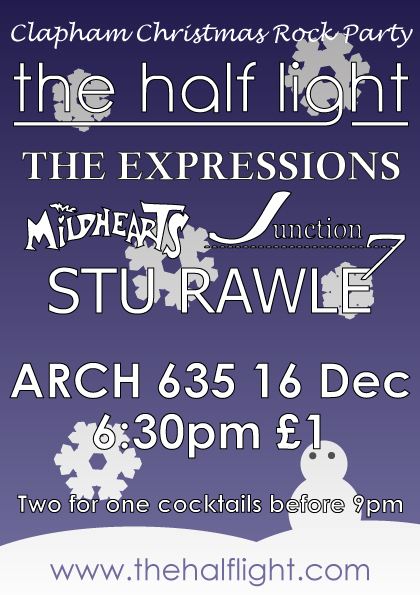 The Half Light are joined by The Expressions, The Mildhearts, Junction 7 and Stu Rawle at Arch 635 on Sunday 16th December. 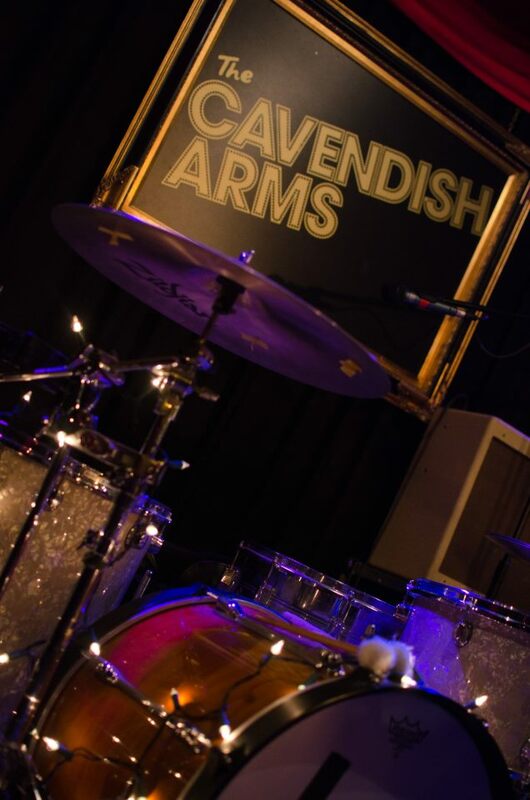 Five bands, festive cheer, two for one cocktails, and all for a pound. Check gigs for more info. 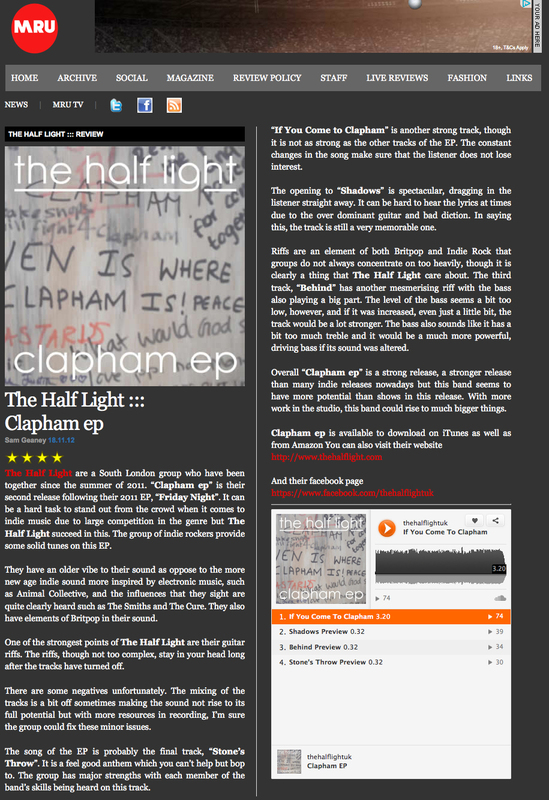 Music Review Unsigned have posted this review of the Clapham EP. 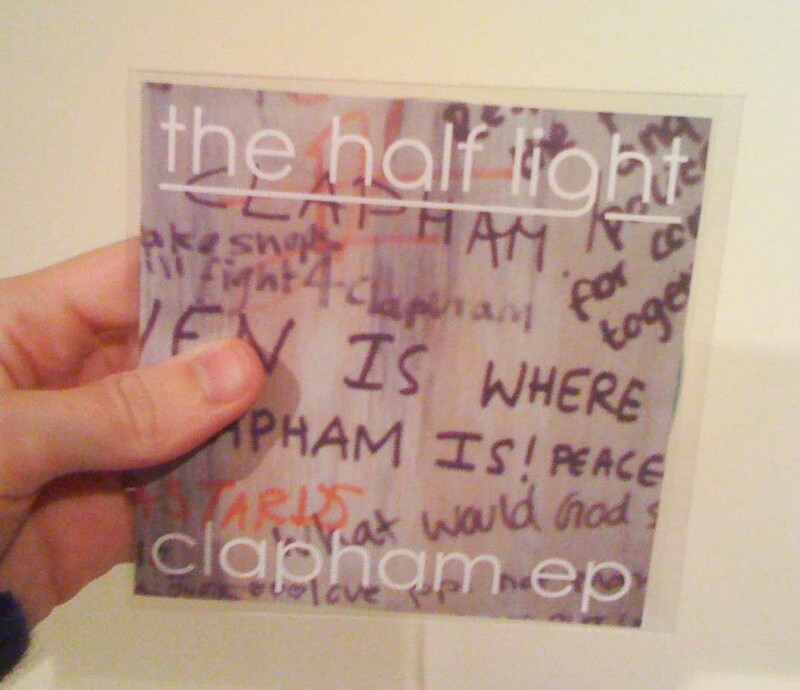 To get your hands on a CD copy of the Clapham EP, send £5 via PayPal, with your name and address, to thehalflightuk@gmail.com, and one will be posted out to you. Limited numbers available. Contact the band for international postage costs. 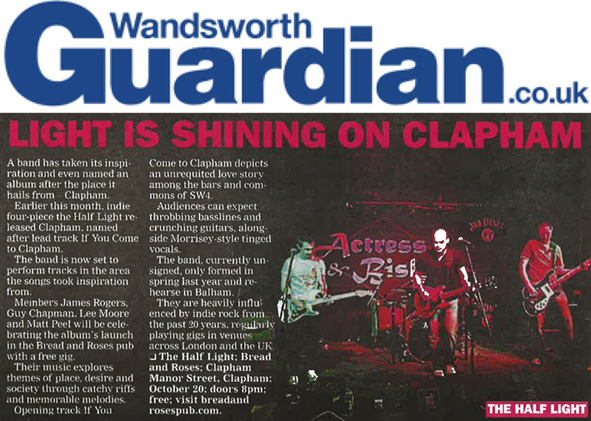 The Wandsworth Guardian ran this preview ahead of the Clapham EP launch. 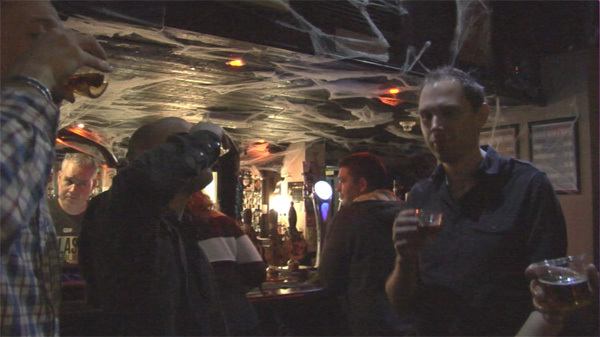 The Half Light are looking for fans to appear in some South London shots for the upcoming If You Come To Clapham video. If you would like to take part, contact the band with your details and your favourite place in the Clapham area, or somewhere that is special to you. Location isn't too important, but bonus marks will definitely be awarded for anywhere with Clapham/Lambeth/Wandworth signage in the background. Couples and groups welcome, if you can't think of a location but would like to get involved, get in touch as the band already have a few in mind. 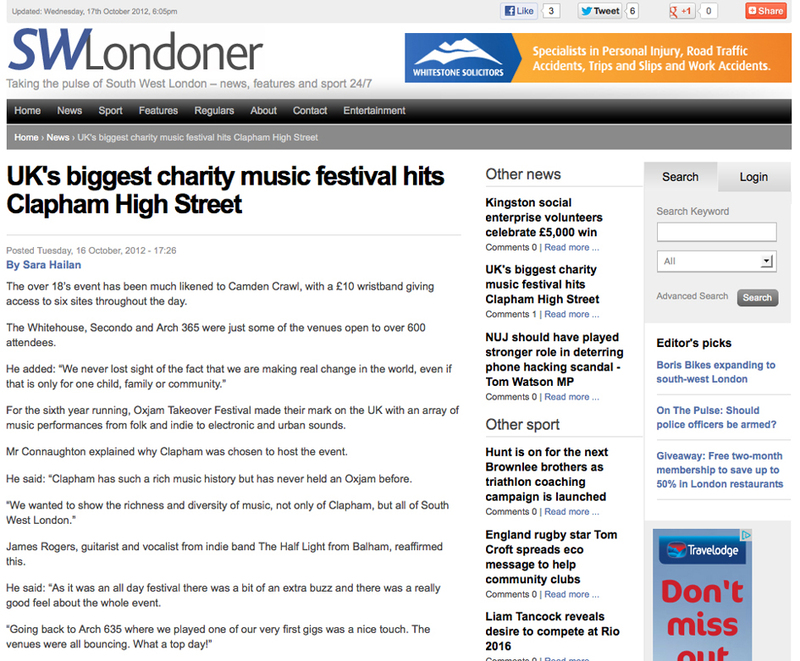 James has had a quote included in the SW Londoner's report from Oxjam 2012. 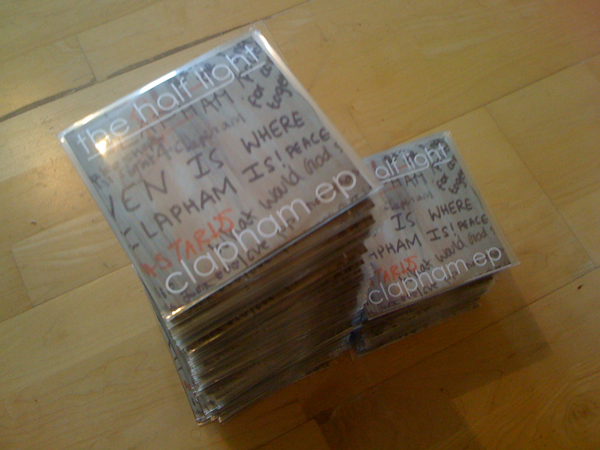 Clapham ep is now available, check the shop for details. Clapham merchandise now also available. Tomorrow's gig will now be at 7:30pm in Arch 635. 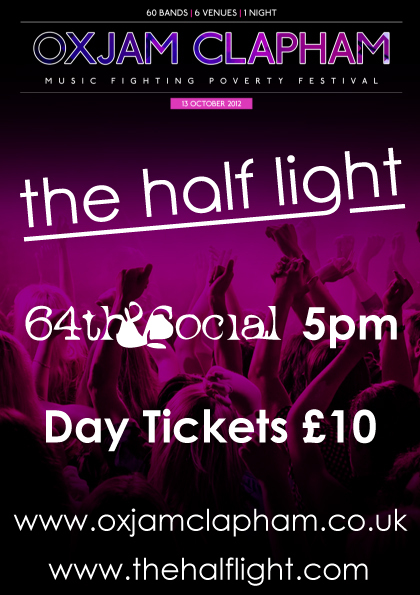 The Half Light play Oxjam Clapham this Saturday. Check gigs for more info. Listen to If You Come To Clapham and preview other songs in music now. Clapham EP is released on Monday 15th October. 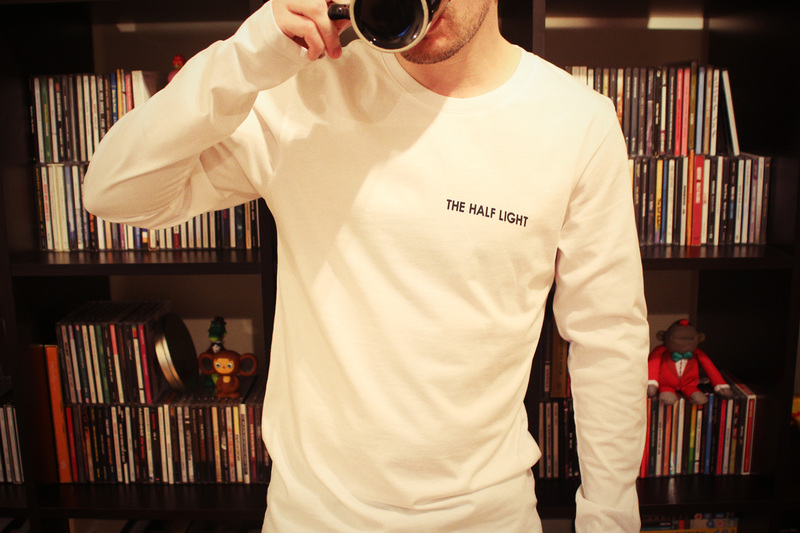 The Half Light shop is now open. Click to get your shirt/mug on! 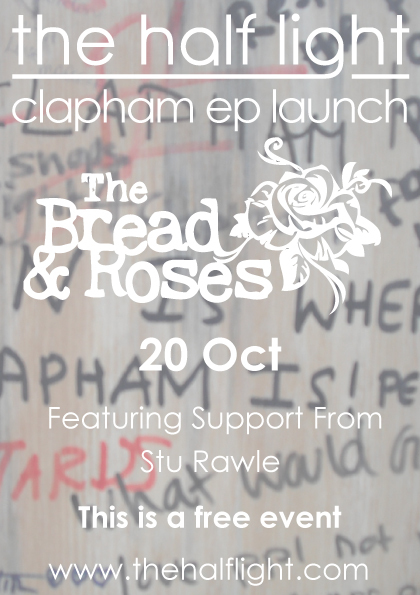 To celebrate the release of the forthcoming Clapham EP, The Half Light will be hosting a free night at the Bread & Roses. Check gigs for more info. 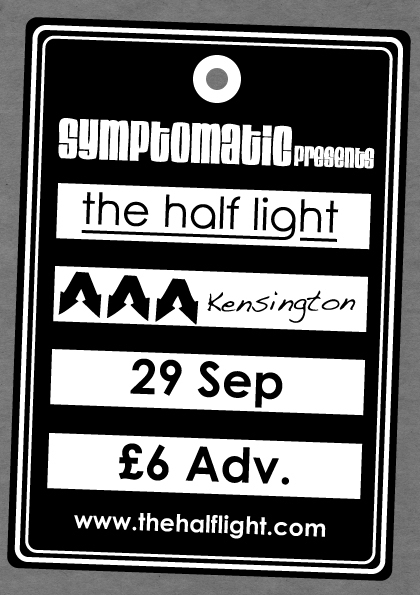 The Half Light play AAA in Kensington on Saturday 29th September. Check gigs for more info. 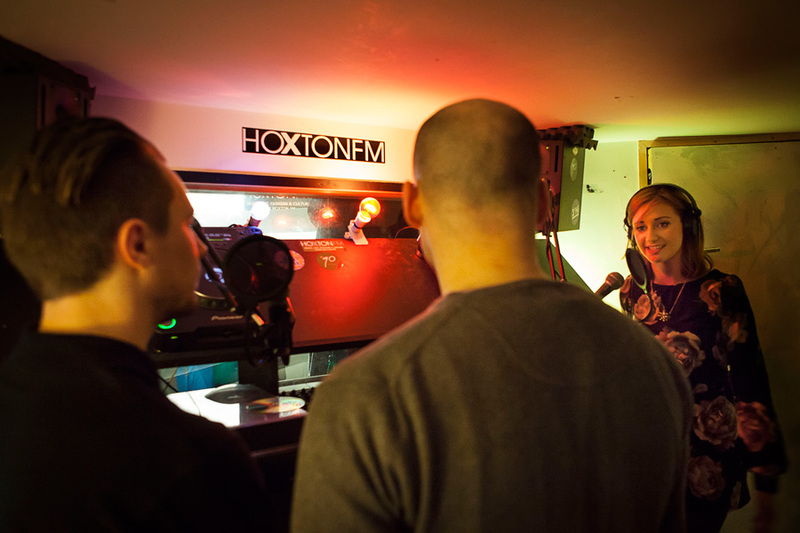 Eight photos from the Clapham EP sessions are available now on facebook. 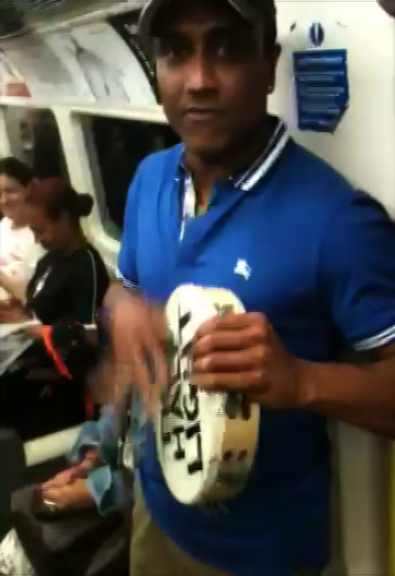 Thirty seconds of Tamborine excellence available in videos now. Thirteen shots of the Birmingham and Staffordshire dates are now available on facebook. A selection of rehearsal pictures are now available in photos.